We have just got back from our annual trip to Basilicata. It was our fourth visit to this special place, famous and admired for its cave dwellings, Sassi di Matera. It is quite funny how certain destinations just grab and captivate you completely. Without a great deal of planning ahead you end up coming back to this unique and longed for place year after year. This is exactly what happens to us every time over the winter period. I particularly adore the cold crispy nights and an occasional fog that sets heavily over the stone buildings. Sometimes it so dense that we are happy that we know our way around the Sassi (the stones). The streets are narrow, lit by an accidental lamp and a narrow window light. They are equally spooky and romantic, and the views of the caves are just breath taking. The hotel that we always go back to is a unique project with its main object to provide its guests with as close of an experience of living in a cave as possible. Sure, we are talking about the modern and more comfortable way of living but still respecting and paying a great importance to its heritage. Every single time we really look forward to spending a couple of days in the grotta (cave), we feel cosy and relaxed thanks to the generous amount of candles spreading their light around the whole cave room. As always on our road trips we brought something to remember Matera by. On this occasion we paid a visit to a very unique (there is a lovely story behind the azienda) and no doubt with a bright future a female wine maker of the Aglianico wine grape. Smaller production and high quality go hand in hand which is something that I truly believe in. We first heard about this particular wine maker over a year ago and are slowly building a small collection at home while eagerly awaiting the release of the latest vintage of which we have already had a preview. 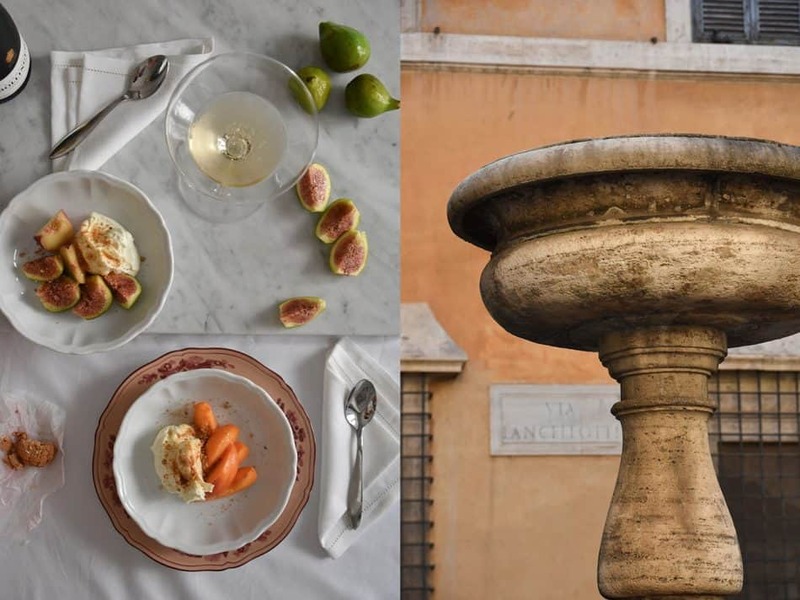 Upon reflection and a closer look at our eating habits, there is a dish that we crave for almost immediately when we return to Rome from any trip. We just unconsciously gravitate to it. We order it in a restaurant or make it at home without a great deal of planning involved. 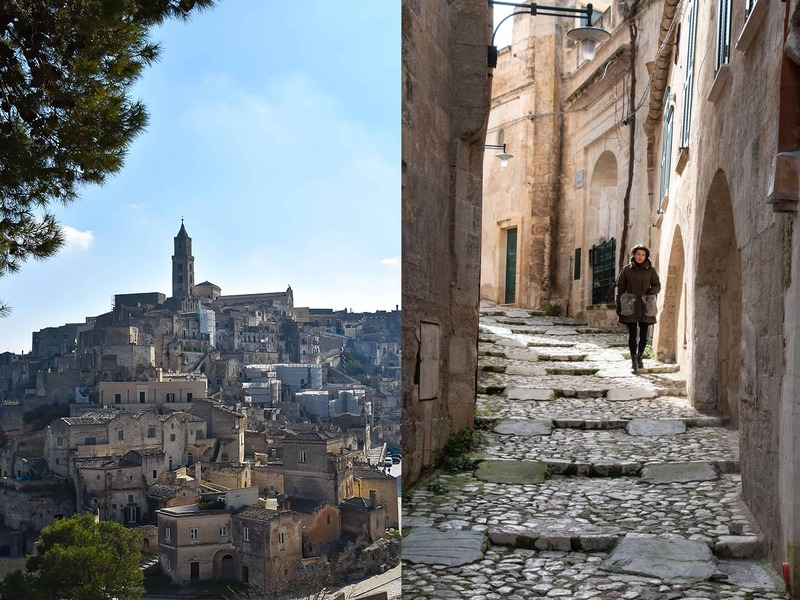 We could compare it to our fondness for Matera but unlike Matera we can access it more frequently. L’ Amatriciana, a pasta dish, common in Rome (originating in Amatrice) and loved by many. First, it stole the Dégustateur’s heart. It took me a bit longer to become infatuated by it, perhaps it was due to the fact that I was not used to or familiar with cooking with guanciale, which is so representative of Roman food and its region. Nowadays when I think of Lazio I immediately have guanciale in my mind. Of course, you can always play with the original recipe (which in Italy already would have a few variations) and use other ingredients if the ones that the recipe is calling for are hard to find. The name derives from the word guancia (a cheek) and it is a piece carved out between the pig’s jowl and cheek, and then cured. It is fattier than pancetta but there is no real need to use plenty of it. Its main objective is to enhance the dish with its flavour, but on the other hand, who doesn’t like the crunch of it too? At the beginning when we moved to Rome, the Dégustateur would order l’ Amatriciana on every possible occasion. I was actually getting slightly annoyed by it as there is so much choice available. But then, you can’t take an English man away from anything bacon like. And I must admit, thanks to that I managed to try this dish in so many places and be able to spot subtle differences. The original recipe is strictly followed, however, as always there already exist little variations to it. Some would swear that onion should be on the (fairly short) list of ingredients, others have been strongly criticised for adding it. 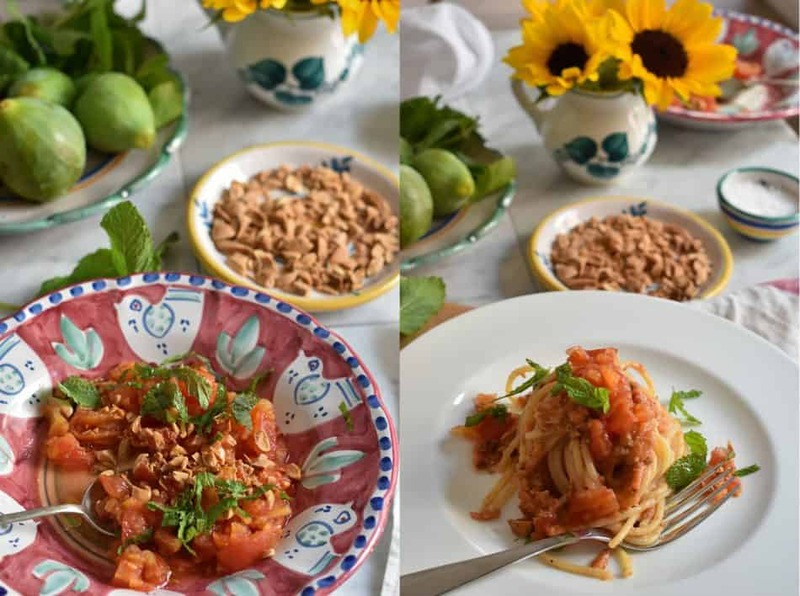 So, what makes the l’ Amatriciana so special for us? To start with it is the fact that the Dègustateur really loves it and I am always happy to make it for him. I am patient with preparing the sauce. You see, a large number of different sauces can be put together during the time allowed for cooking the pasta until al dente. On this occasion however, you start with gently frying guanciale lardons until they become golden and slightly crisp. Next step is to soften its taste with some white wine (sfumare), you just pour in a small glass of it and wait until it evaporates. And then come the tomatoes, rigorously crushed by hand. One small chilli pepper and a generous portion of pecorino cheese stirred in seconds before serving. L’ Amatriciana takes roughly 30 minutes to make but it is one of those sauces that can be made in advance and stored in the fridge until needed. My latest obsession has become gnocchi and the story behind it was to find the right recipe. It may seem trivial, but the devil is in the detail. After having eaten gnocchi in a few restaurants in Rome, light as air by the way, I started to question the recipes I have used used in the past. There was absolutely nothing wrong with them but now the end result seemed too floury to me (but still tender). Gosh, one gets spoiled for food in Italy and all those little things are of crucial importance. I did a little research and the answer to what what makes the difference is the egg, if used at all. Let me explain, it is better not to use an egg (which can make the gnocchi hard) but add the egg yolk (only) to help bind the ingredients. Well, the only way to find out is to make gnocchi both ways. Freshly made and cooked gnocchi, tossed with l” Amatriciana sauce will make a perfect variation from pasta. In fact, gnocchi all’ Amatriciana are very often served in Rome and it is worth trying them. 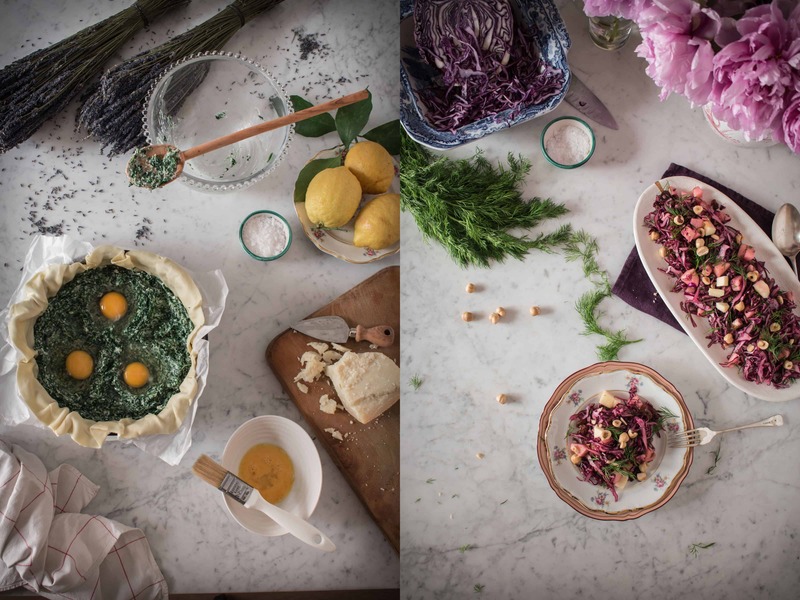 Slowly we are heading towards Spring, and the brief period of eating raw baby artichokes in a salad with shaved parmesan, agretti that I already had a taste of and the Roman soup la vignarola. 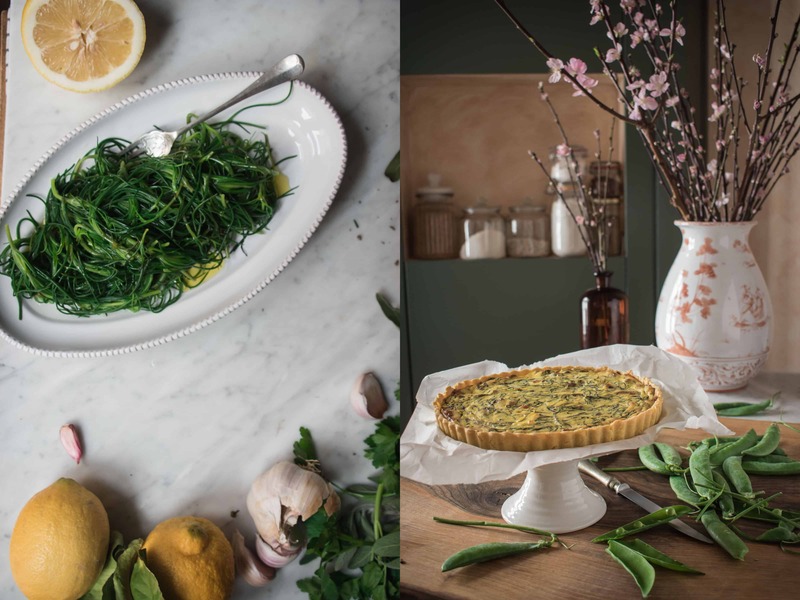 Agretti are needle-shaped long green leaves of a very particular and delicate mineral flavour. They are traditionally served with olive oil and lemon juice but they also find their use in a ricotta and guanciale quiche or tart as it is called in Italy. Having said that, the carnival period and its festivities have not come to an end yet. Every region in Italy has its own sweet specialities made only during that time of year. In Rome they are frappe, castagnole and bignè di San Giuseppe which are my favourites. Anything that comes with the pastry cream is a winner for me. It is nothing else than pastry cream filled small balls of choux pastry which, respecting the tradition, have to be fried and not baked. And bignè di San Giuseppe are exactly what we had to sweeten the end of February. We had such a wonderful and enjoyable Christmas at our home in Rome. Christmas actually started a few days earlier for us. A number of things made us appreciate and feel festive as soon as we came back to Rome, left the bags to unpack in the morning knowing that no further work related trips were planned until the first weeks of January of the New Year, 2019. Rome has been very cold recently which only helped us feel the Christmas atmosphere immediately. The christmas illuminations were so beautiful this year, somehow more special or maybe we were just relaxed, grateful and just happy. The late morning Christmas grocery shopping was filled with joy, exchanging wishes and little gifts with our local food vendors, shops keepers and eateries that have been welcoming us regularly since we arrived in Rome. Our final port of call was “our local” wine bar (not exactly on our door step but it is our favourite) for a quick glass of bollicine. We received a lovely gift, a bottle of Ferrari sparkling wine from the owner to take away, and with bags even heavier we were ready to go back home. I took care of preparing all the festive meals, you may know by now that I love cooking, and the Dègustateur took control of the wine. On Christmas Day as per our small tradition we walked to The Roman Forum which is closed on that day. We found a perfect spot to pause and admire its full and unspoiled glory. And then came the day to take a morning train and set off to Venice. For us every opportunity is good enough to visit this breathtaking city. It was the first time that we have visited Venice during New Year’s Eve. We hardly ever celebrate the end of the year, I find it too commercial and cliched. I’d rather spend the evening having a nice simple meal sipping a good wine in a homely atmosphere. Since Venice feels like home to us by now, why not to watch the fireworks there? So we went. The train journey is never a hardship, usually I catch up on reading or come up with new ideas what to do, visit or revisit. Mainly the agenda evolves around the food which I’ve grown very fond of. Once you understand Italian regional food you will never get bored. Quite the opposite. And the food of the lagoon and its produce is no exception to that rule. The weather was just perfect, crispy cold but sunny days with the fog settling on the water in the evenings. So mesmerising and magical, even spooky at times. As soon as we arrive in Venice we tend to go for cicchetti, small snacks typically served in bàcara which can be either served on a piece of bread or polenta but they could also be small servings of food like a meatball, moscardino, artichoke heart, boiled egg with an anchovy and so forth. All washed down with a glass of lovely prosecco. And that is exactly what we did upon our arrival a couple of weeks ago. The weather was so beautiful, in fact perfect for a boat trip. 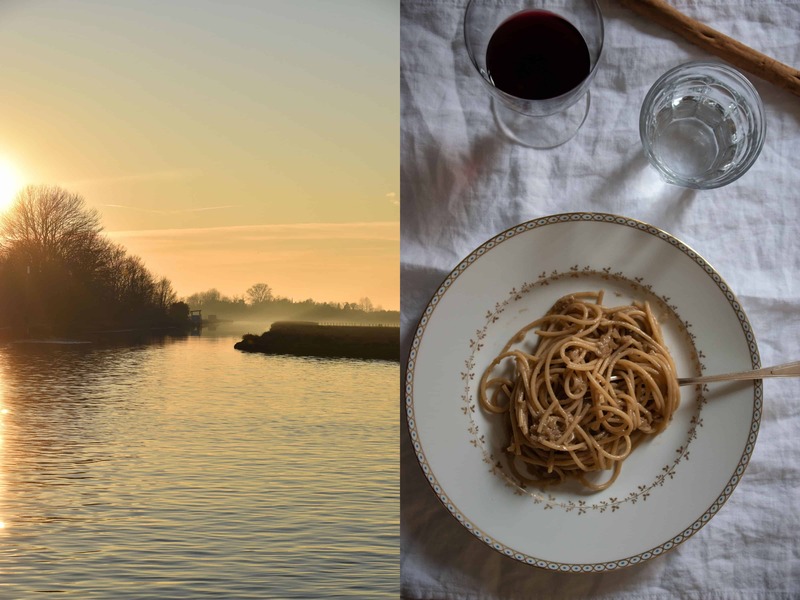 It didn’t take us long to decide to make a bit of an experience of a Sunday lunch and we were off to the blissfully quiet Torcello island. A home to only a handful of inhabitants but also home to the iconic by now, Inn and restaurant Locanda Cipriani. Ernest Hemingway having been smitten by the island’s unique charm, settled in the Locanda Cipriani during the fall of 1948 dividing his time between writing and duck hunting. Having read “Autumn in Venice” by Andrea di Robilant talking about Hemingway’s love affair with Venice and the muse he met there called Adriana, I have been longing to visit Torcello island ever since. We enjoyed every single course we had, baked scallops, langoustines in saor, pancakes with radicchio and veal ragù followed by fegato alla veneziana (calves liver with onions and polenta) and fish and shellfish soup. We discovered yet another great wine from the Veneto of which I managed to buy one bottle in a local wine bar to bring back to Rome. Cold weather calls for pasta e fagioli, a warming and thick borlotti bean cream with some pancetta and short pasta. I make it at home very often. Not only because it reminds me of Venice but because it is also simple to make and delicious. There is nothing more comforting than sitting by the window in one of the Venetian osteria and watching the world go by while eating a warm plate of pasta e fagioli. The world seems to slow down. I feel warm and calm. Who knows, maybe that is the influence of “La Serenissima” on me? The almost 25 minute long firework display was extraordinary, one of the most spectacular ones that we have seen. We are asking each other right now: shall we see it again? A part of the fun is to revisit our already favourite restaurants but also to discover new ones. This trip was extremely successful. I have yet more eateries and new dishes that I will be looking forward to having again to add to the already extensive list. Having bought two kilos of bigoli pasta (not easily found in Rome) we are ready to go back. On the train I am thinking of a menu for a dinner with friends just a few days away. I’ve been talking so much about bigoli in salsa to them, that they have built up a good appetite for this dish. The sauce is simple, made of onions and anchovies but the key is to allow the onions to sweat and turn into a sweet sauce contrasted by the saltiness of the anchovies. 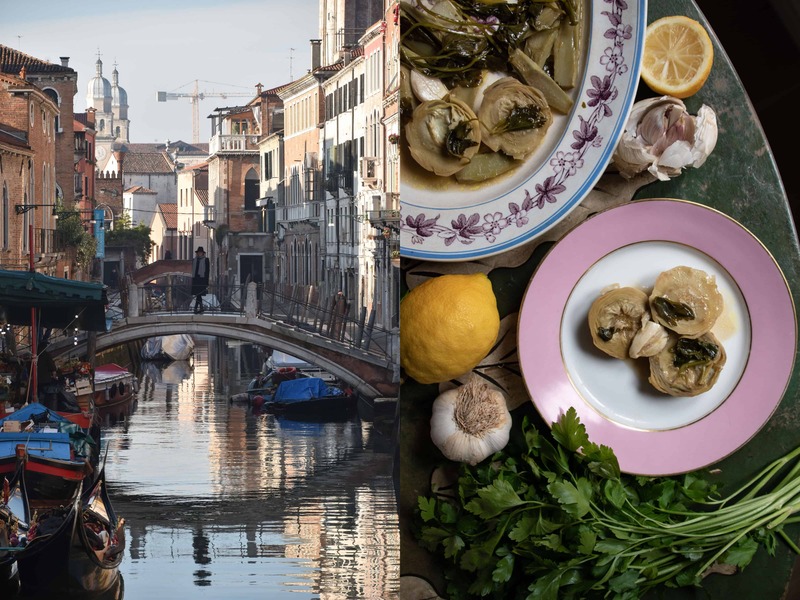 Venice was once the largest spice trade port in Europe and you can find the influences of that period in many dishes. My little touch on the bigoli in salsa is to add a pinch of cinnamon, which in my opinion binds the flavours of the lagoon and its history together. But then I could still remember that lovely creamy chestnut and langoustine risotto which I had on New Year’s Day. Well, the train journey was long enough to allow me to decide. 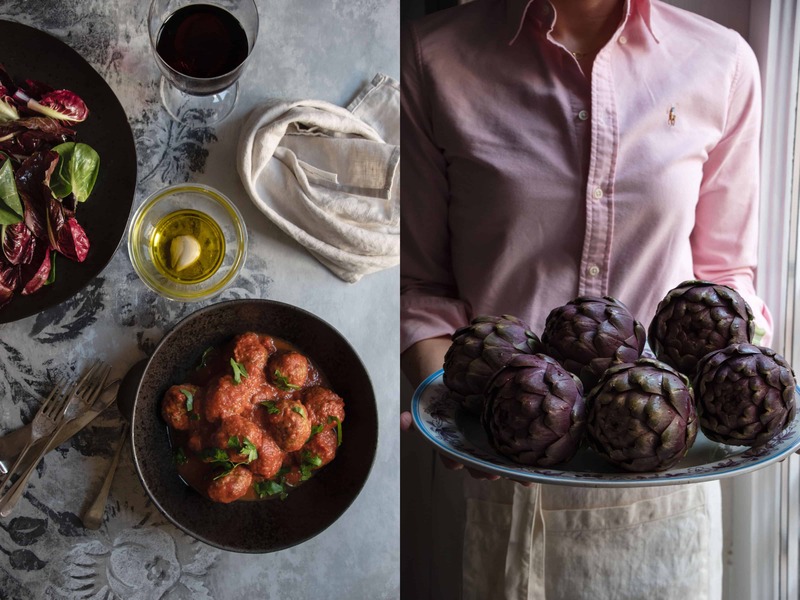 In Rome we have artichokes alla Romana, stuffed with mentuccia, parsley and garlic and cooked until tender and drizzled with some lemon juice just before serving. They are more laborious but definitely worth it. In Venice the artichoke hearts are the local treat. They are fried and then cooked with garlic, lots of fresh parsley and white wine. So I made them to start our dinner with. I had promised my friends the bigoli pasta dish a while ago so I kept the promise and we had them as the following course. The risotto will wait for another dinner, perhaps just two of us and that lovely bottle of red wine that we brought with us? I think yes. 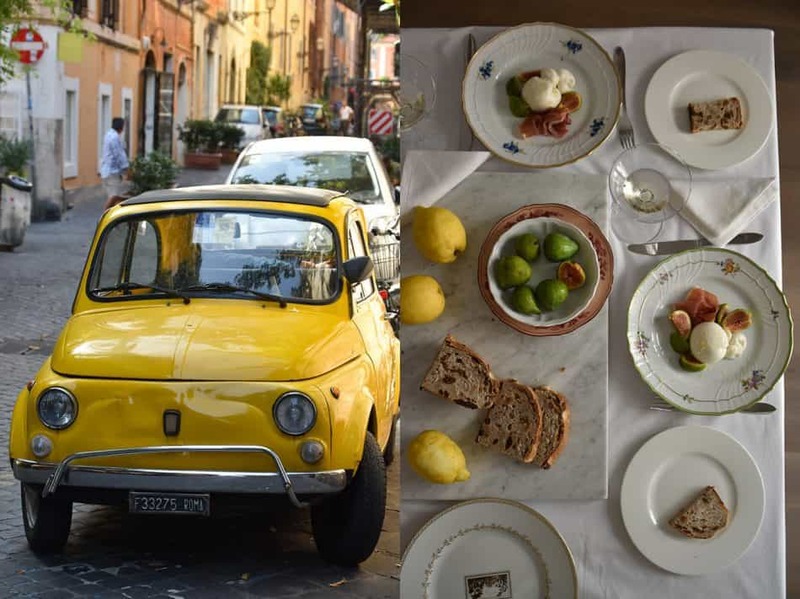 In Rome I began to make “my Italian meatballs” with grated lemon zest and parmesan cheese. I also like to add minced veal to the meat mixture. They are very delicate yet distinctive in flavour and I serve them with a plain tomato sauce. They get better overnight hence I decided to prepare them for our last savoury course. That way I can just heat them up and be able to dedicate more time to the guests. There is always a salad, a plain salad made of my latest obsession: radicchietto salad leaves dressed with garlic infused olive oil and a good wine vinegar. Having just returned from Venice, I couldn’t choose anything else to end the meal but tiramisù (link). 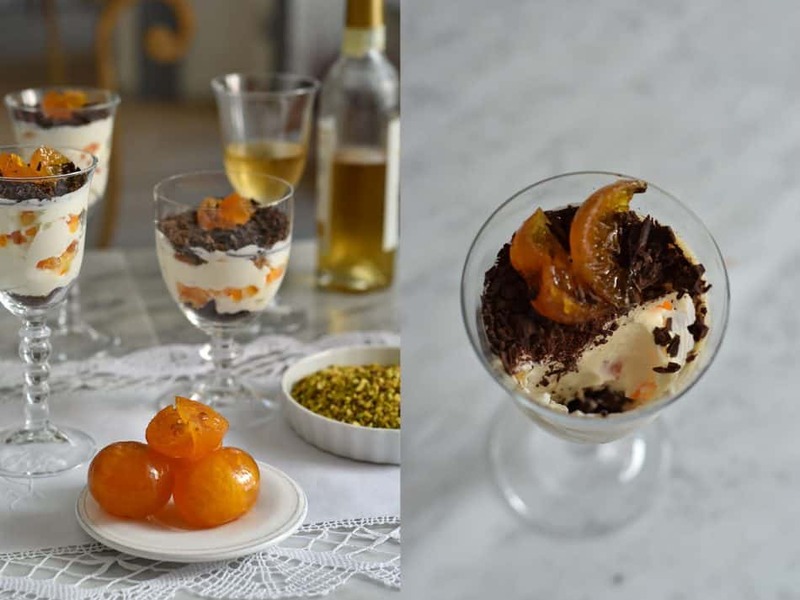 Italian desserts are not overly complicated but they require good quality ingredients as well as a perfect balance and flavour combination. There are so many versions of how to make “the perfect” tiramisù in respect of the alcohol being added or the coffee and so forth. Here is my recipe that creates the sought after by us delicacy of the textures with just a hint of coffee and warmth of alcohol running through (a blend of rum and Marsala wine). As children my brother and I were looking out for the first star in the sky. That was the sign that we can sit down to our dinner. We were so impatient that of course we always managed to spot the first star at 4pm, we just couldn’t wait until 7pm which was the official time for the Christmas Eve feast to begin. Another part of the tradition set in stone is to share the opłatek (Christmas wafer) with everybody and exchange best wishes. Now is the time to eat. We will spend Christmas in Rome this year and we will do exactly the same. The opłatek is already waiting and traditions should be maintained. Risotto is a completely Italian affair that cannot be compared to anything else. There are very few other ways the Italians eat rice other than in risotto. What makes a risotto is the whole process of cooking it with devotion, care and love. I absolutely adore making this dish which I find therapeutic and relaxing. There has been a lot of misconceptions about cooking a risotto but once you understand a couple of very important steps, every kind of risotto will seam easy. The mystery is perhaps how to achieve the al dente rice (the rice should still have some crunch to it) along with its starchy creaminess at the same time. The grains of a beautiful and creamy risotto should look like pearls and that is why the choice of the rice is very important. My most frequent choice is carnaroli rice with its thin long grains that become almost translucent while holding their shape very well, but most importantly it gives the risotto that sought after creaminess. Apart from carnaroli rice there are also arborio and vialone nano grains . They are perfect for a risotto but those grains have a higher starch content that makes the risotto more dense. Risotto might have been seen as a warming dish of the northern provinces of Italy (where the rice crops are cultivated) but there is a lot more to it. The finesse and elegance of a simple risotto are the most representative words that I can think of. Another crucial ingredient for a risotto is the stock that will determine the taste of the dish. I highly encourage you to make your own stock (you can make a couple of batches at once and store them). It is said that one of the most important stages of making risotto is “mantecatura”, which means vigorously beating in the butter and cheese right at the end of cooking and allowing it to rest for a couple of minutes to give the risotto its wonderful creaminess. Perhaps you may need to make the risotto a few times to get the feel of how the individual stages build the dish and make it come together with the mantecatura towards the very end. 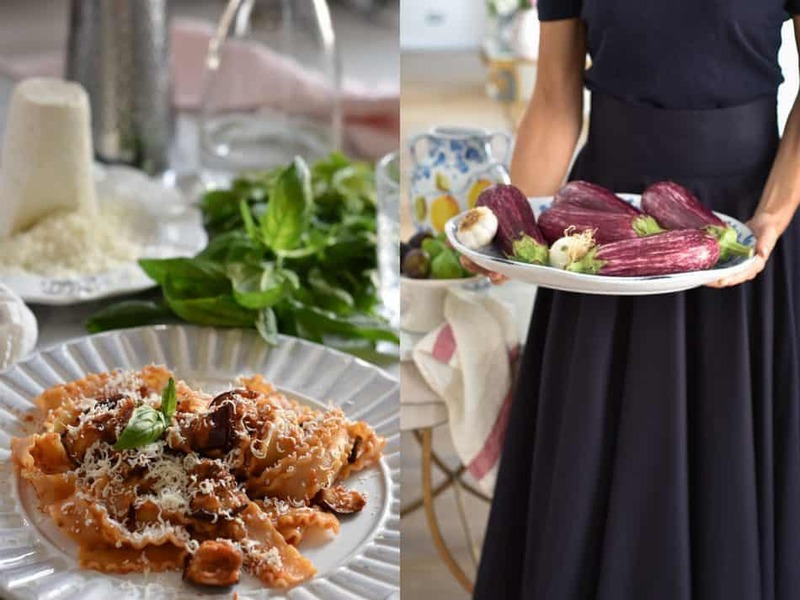 Of course, as always with Italian cooking, the recipes will vary from city to city, village to village, home to home but the steps remain the same. First you will start with gently frying the onions in butter (sometimes also garlic and other ingredients for example mushrooms or a sausage depending on the risotto you wish to make). Northern Italy is a land rich in dairy produce so of course butter is used. Next you add the rice to toast it. Every grain should be warmed up and coated by the mixture. At this point you usually pour in a glass of wine and let it completely evaporate before you start adding the stock (which should be warm when it is time to use). Stock should be added slowly, even only a ladleful at a time. Once the stock is almost completely absorbed it is time to add more while stirring almost all the time. If you are making for example a seafood risotto, you will add the seafood at some point of this stage otherwise wait until the rice is ready, which means al dente. Take the pan from the heat, wait a moment and stir in the cheese and cold cubed butter for the final stage called mantectura. My first risotto I have ever made (that I was very happy with) was the saffron risotto also known as risotto alla Milanese (a staple dish of Lombardy and Milan in particular). At that time I didn’t live in Italy and was spending most of my time in London. It was in London where my interest in food took another dimension. An Italian friend of mine recommended a book by Giorgio Locatelli, an Italian chef living and running his Michelin starred restaurant in London. That moment was a turning point for me. He has become one my favourite chefs and authors. His honest and humble approach to the restaurant scene of London and of course to the regional food of his native country is so inspiring. I actually have his book next to me while writing this post. I was particularly taken by one of the episodes of his TV series where he was making the risotto alla Milanese (at that time in the premises of Gualtiero Marchesi’s restaurant in Milan, who is considered to be a founder of modern Italian cuisine, unfortunately he passed away almost a yer ago). So this is my small homage to both chefs and the risotto that the Dégustateur and I adore. It is simple, elegant, a pure perfection. This is the essence of Italian cooking. 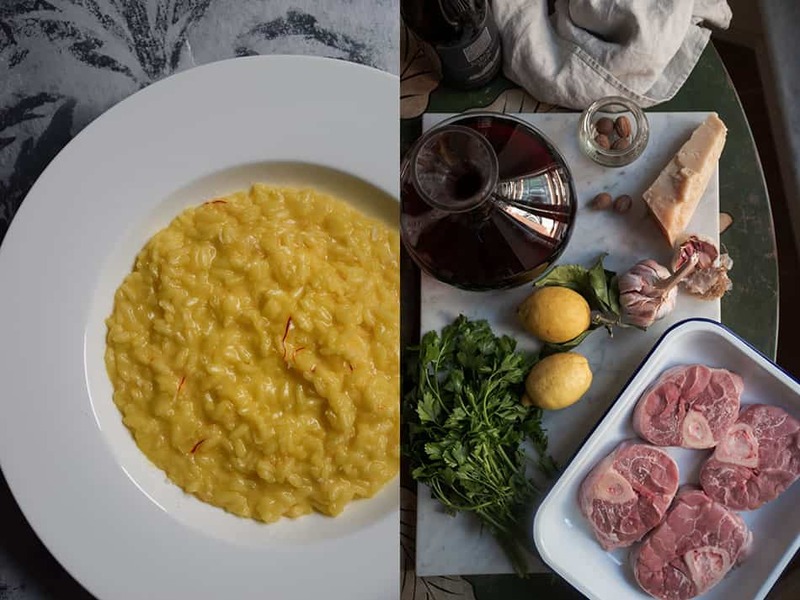 Very often this irresistible saffron risotto serves as a bed for osso buco (veal shanks braised with vegetables and white wine until they melt in your mouth, a speciality of Lombardy). As much as I enjoy both dishes I choose to make a velvety Italian style potato puree (with grated parmesan and some nutmeg) instead and devour the risotto alla Milanese just on its own. Another risotto of Northern Italy that we particularly like is risotto with Barolo wine and Castelmagno cheese. These are the flavours representative of Piedmont. I started making it once I moved to Italy and I believe it is still fairly unknown beyond Italy, which is a shame. 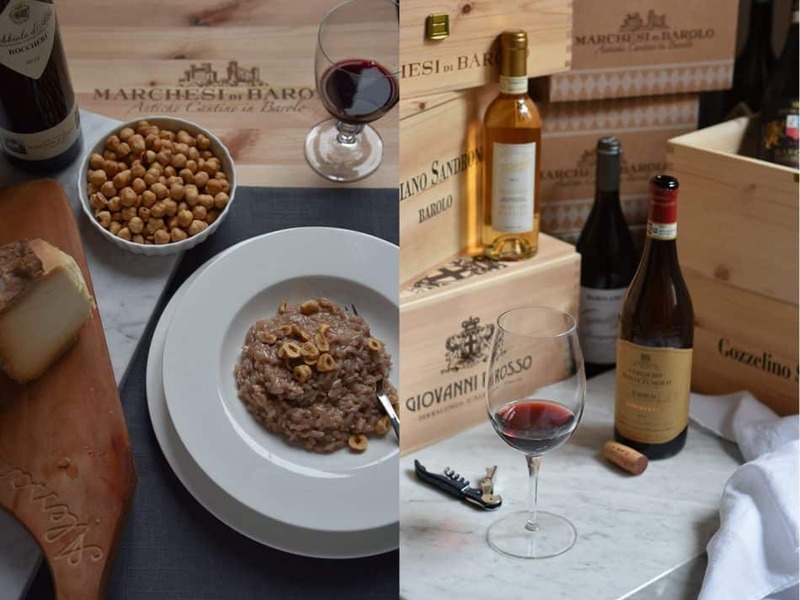 We particularly enjoy the risotto al Barolo during the autumn and winter months with a glass of red wine (from Piedmont of course, most likely Barolo or other Nebbiolo grape wines). Despite the fact that I can buy Castelmagno cheese (dense and crumbly cheese from the province of Cuneo that is milder when young but develops some spice when it ages along with a blue mold) in Rome I tend to bring it back from our frequent trips to Piedmont, which makes it more special to me. I am more generous with the red wine proportions to the white one when cooking this risotto. I love the depth of colour it gives to the rice and of course the flavour which depends on the wine of your choice and the stock. As my little twist on the classic I sprinkle the risotto (just after stirring in the butter and the cheese towards the end) with toasted and roughly chopped hazelnuts from the Langhe region (Piedmont). Could it be any more Piedmontese than this? 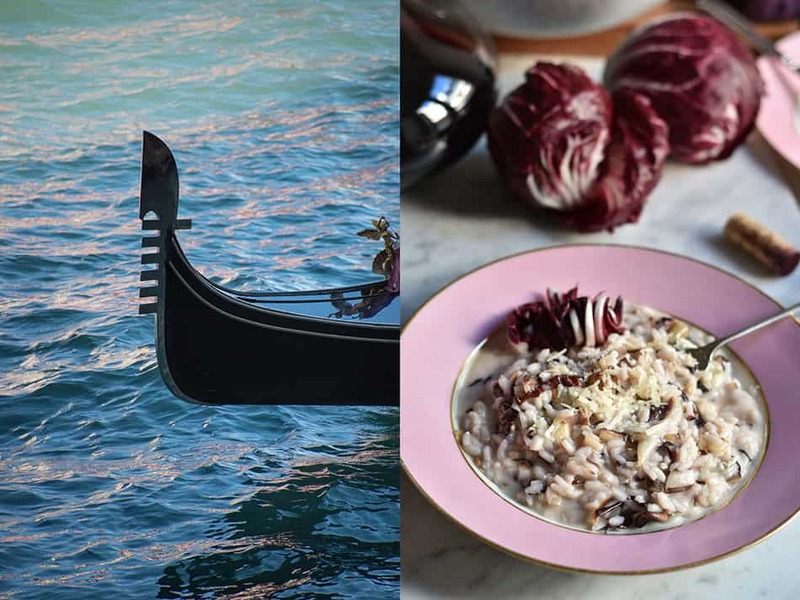 And of course there is the region of Veneto, the land of radicchio, the colourful chicory known for its distinctive, elegant and slightly bitter taste that of course has found its way into risotto. Radicchio tardivo di Treviso, tall and pointed, is considered the most precious with its elegant shape, deep red colour and a milder flavour. Other varieties of chicory like radicchio di Chioggia (of a round shape and dark red colour) with slightly more bitter notes will be just fine. The radicchio is added towards the end of cooking risotto so it holds its shape and still has some crunch to it. 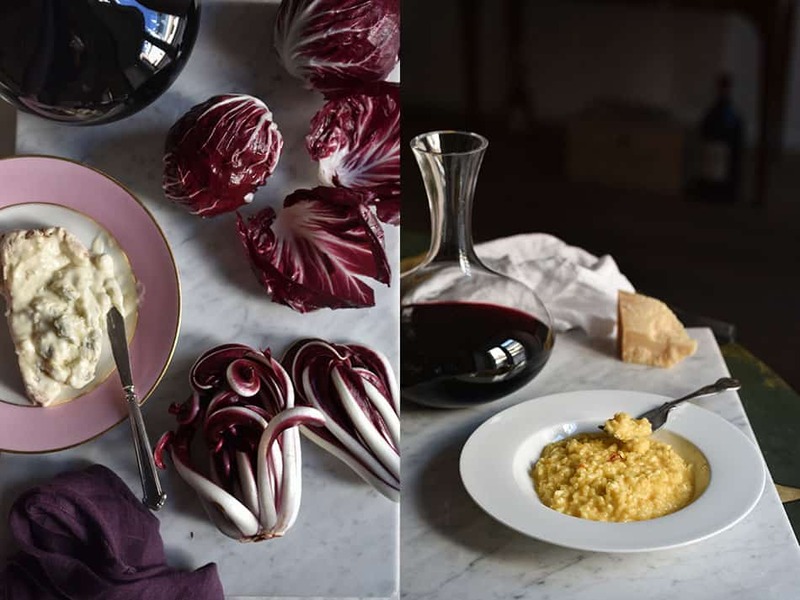 On most occasions I prepare the risotto with radicchio just with parmesan or Grana Padano cheese and butter to finish it (mantecatura). 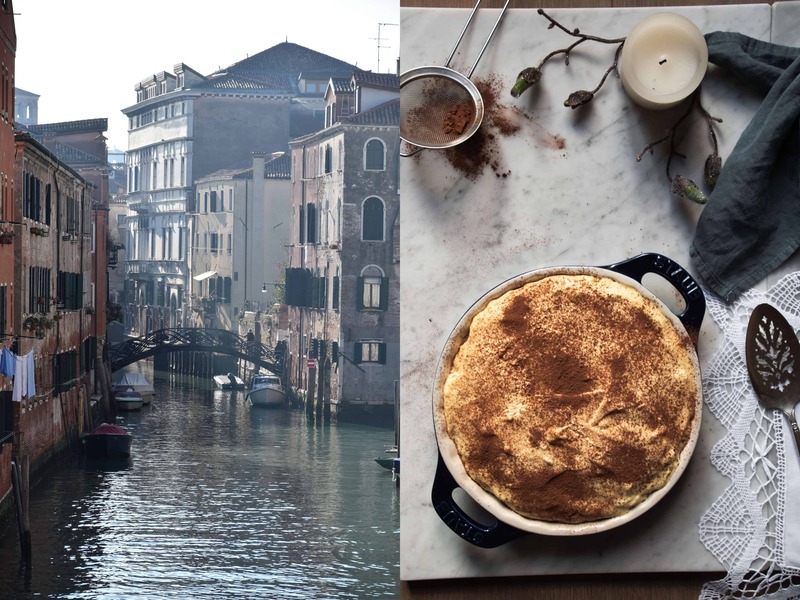 On one occasion however, while in Venice I had it with an addition of sweet gorgonzola cheese and since then that heavenly creamy and indulgent risotto has made its way into our home. 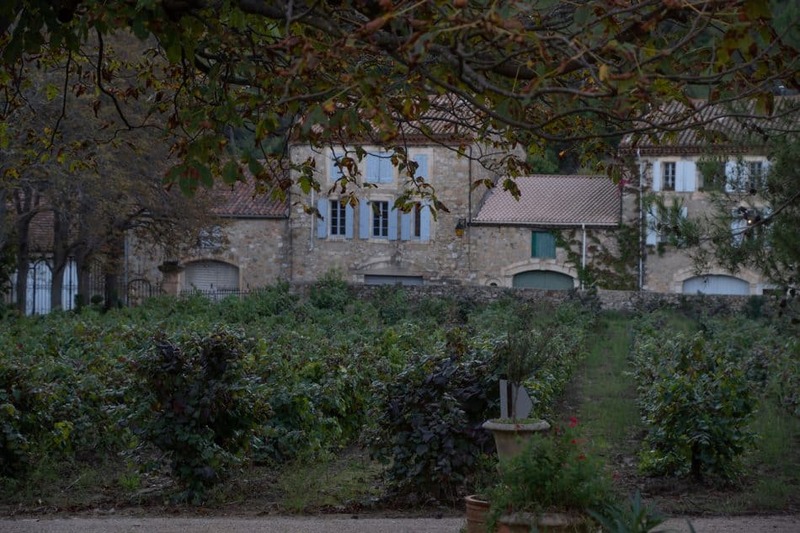 Last week we set off for an impromptu road trip to The Languedoc region of Southern France. Well, let me start from the beginning. 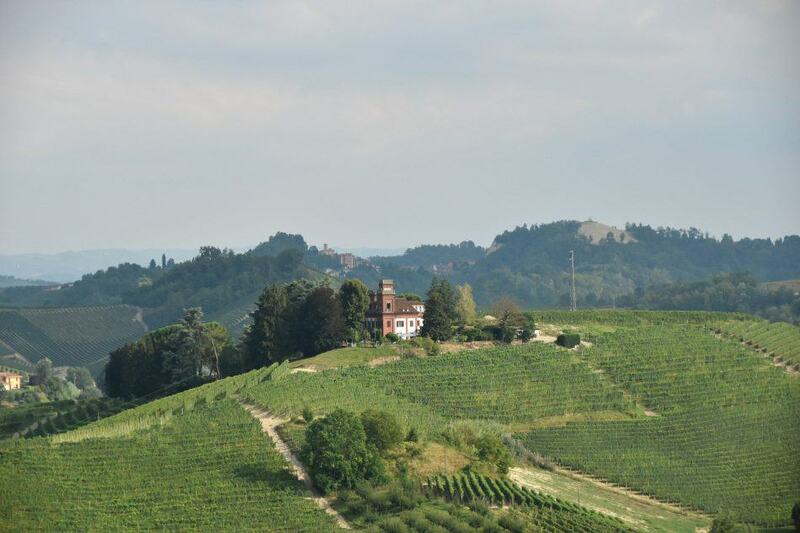 A while ago we had planned a weekend in Alba (Piedmont) to attend The International White Truffle Fair. 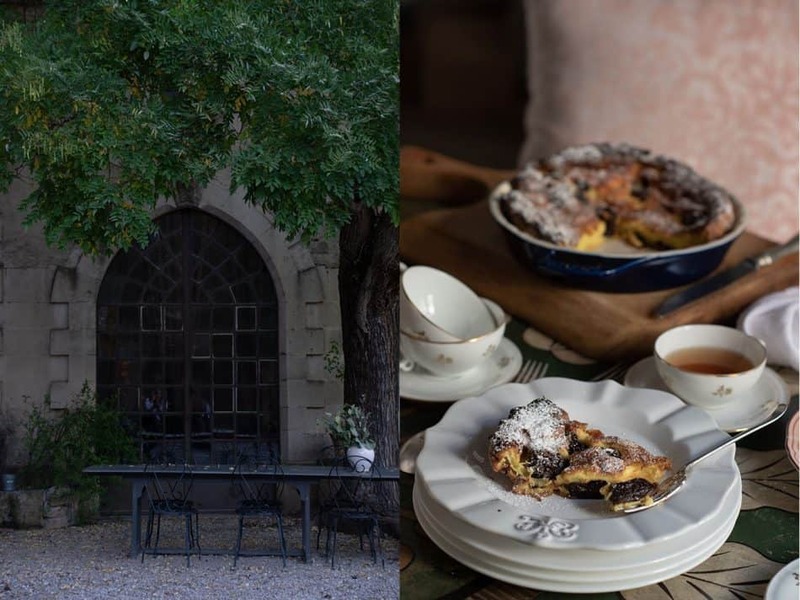 Visiting Piedmont during Autumn has by now become an annual pilgrimage. The atmosphere in the town of Alba is just fascinating, the food markets almost on every street and square possible, wine bars and the permeating smells of porcini mushrooms and freshly shaved white truffle are so evocative. The decision to add France to the trip was made just a couple of days prior to our setting off and subsequently we left for France from Rome with a stop over in Portofino in Liguria. We had never been to The Languedoc area before and I was really looking forward to the trip. I was also looking forward to tasting the food as well as sampling the wines that are hard to find here in Rome. The Dégustateur booked us in at a very atmospheric and representative château in a hidden village in the vicinity of Narbonne. We were stunned by the vast acreage of vines with their splendid autumnal colours highlighted by still very strong sunlight. In fact the area gets 300 days of sun per year. On the first night we ate the dinner prepared by the owners of our chateau. Foie gras braised in red wine and spices to start with, followed by prawns cooked in Pernod accompanied by comforting ratatouille (a vegetable stew commonly made in France). A dessert in Languedoc found on almost every menu is crema catalana due to its vicinity and the influences of Catalan cuisine. I always use a recipe for this dessert originating from our favourite Spanish restaurant in London, Barrafina. Grated zest of lemon and orange plus a cinnamon stick are responsible for the extra zing that made me fall for this creamy custardy creation. I’ve only recently bought myself a blow torch to caramelise the sugar on top to create a crunchy cover that you need to gently break first in order to get to the heavenly creamy centre. “Central to most lives here is wine and, after wine, food.” The food is divided between mountain food and the food of the coast. 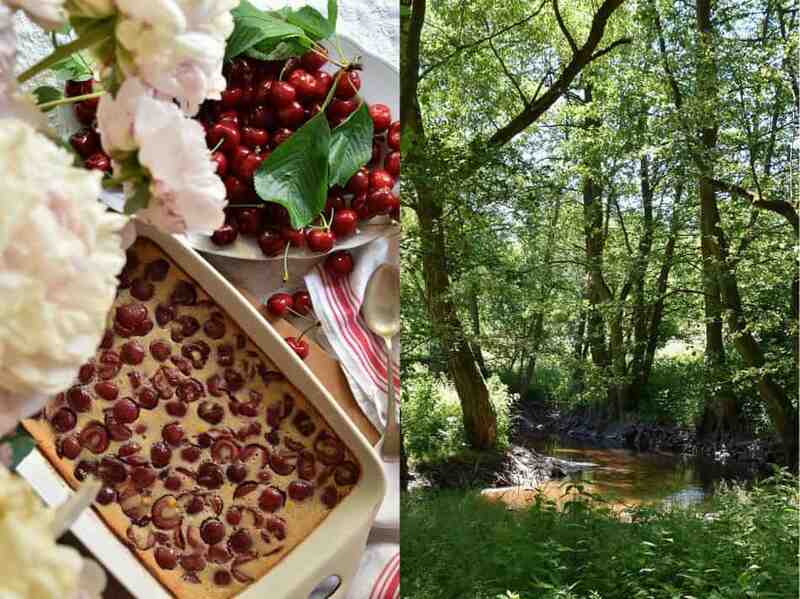 Hunting and foraging play an important role in the area creating its own flavours of southern, simpler and more earthy style of cooking, fairly indifferent to the Michelin styled cuisine of Northern France. Although it is said that the French have lost their way as far as cooking is concerned, here you can still find a deep food culture, perfect execution and a wonderful flavour combination. 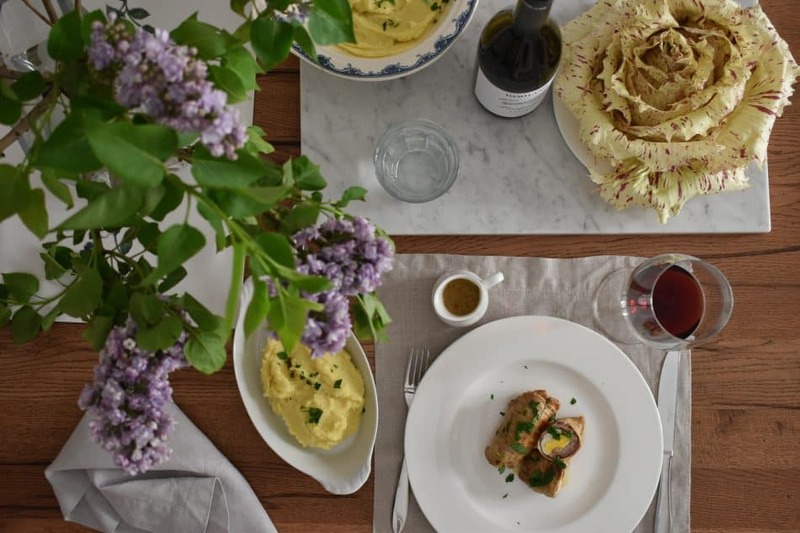 We enjoyed every single meal we had along with the accompanying wine and I came back with my head full of ideas and meals that I have been wanting to make almost forever. In Rome the fall arrives on a slightly later date…and only when the rain comes and the temperatures drop I start craving for hearty and comforting food with earthy flavours paired with a bottle of medium to full bodied red wine, already enjoyed and sipped while cooking, which makes the whole experience of slow cooked meals and dark afternoons come together. There was one restaurant run by an elderly couple that made a highlight of our trip. During low season many places are closed and the choice is limited. I am actually grateful for that find, a perfect example of simple and beautifully made food with love. A simply decorated room with a fire place in its centre (used for grilling steaks) was immediately filled with a very welcoming atmosphere and promising smells escaping from the kitchen. The head chef, the wife, with her perfect english was very happy to share her culinary tips instead of guarding them secretly. Thankfully the menu was reduced during low season because we ordered extra dishes just to be able to taste them, but we finished them all. Every year when I feel that the autumn is here I make beef bourguignon (a dish that probably everybody has heard of) and its season has now arrived. It is a French staple, based on braised pieces of beef (cheaper cuts are used here that require a longer and slow cooking time) in red wine (the wine that is locally available). This traditional and poor man’s food has gained some finesse over the years and the execution involves marinating the meat first and then adding extra ingredients like bacon (I use pancetta), shallots, carrots, mushrooms and lots of fresh herbs to enhance the flavours during cooking. I like to start the process of marinating the meat in red wine with some roughly chopped celery, carrots, onions, garlic and a bouquet garni a day in advance. This way the flavours have enough time to permeate and work its magic. I have made many attempts trying to perfect this dish to our liking. The choice of the beef cut for stewing is your choice and if you are not sure about it your butcher should be able to advise (but be aware that the sauce shouldn’t have too much of melted fat therefore choose a piece for stewing that is still fairly lean with some marbling), ask how long it will take for the meat to turn tender and cut off any excess fat before proceeding with the dish. In Italy the way the butchers cut the meat varies from North to South and when I am at my butcher’s I say first what I wish to make (after exchanging a couple of jokes) and according to that a part of the animal will be selected and cut in front of me. Last weekend I spent pottering in the kitchen. The weather was just perfect, it rained and rained almost all the time. What more could I have asked for. On Saturday (non rainy at that moment and sunny actually) morning the Dégustateur strolled with me (stopping for a coffee at one of the best coffee bars in Rome, in my humble opinion) to the Campo de’ Fiori market where we bought all the missing ingredients for our French inspired cook off weekend. For the side dish for my “beef bourguignon” I made potato purée and another French classic ratatouille, slowly cooked vegetables (onions, courgettes, peppers and aubergine with a few sprigs of fresh thyme) but still retaining some crunch to it. We are spoiled with Italian wines however on this occasion I paired the meal with the wine we brought back from the trip to The Languedoc. In fact, I love matching food and wines from the same region. The artichokes season is well under way here in Rome and there is a French dish that we particularly like: artichokes à la barigoule. You can have it for your first or as a main course, depending on the quantity being served. The prepared artichokes are stewed with shallots, carrots, chicken or vegetable stock, white wine and crispy bacon or pancetta, flavoured with a generous addition of fresh thyme. It is so simple but so comforting and elegant at the same time. The ingredients beautifully compliment each other already, but there are other options of course. For example, I have tried this dish with the addition of mushrooms and fennel over a year ago and I can still remember how good it was. Another delicious proposition for the first course would be a creamy soup of pumpkin and chestnuts (see the recipe/soups), garnished with some crispy bacon and crumbled goat’s cheese. So far as chestnuts go I’ve been using a chestnut cream mainly with many desserts and tarts but I am more and more convinced that chestnuts can have a great use in savoury dishes. 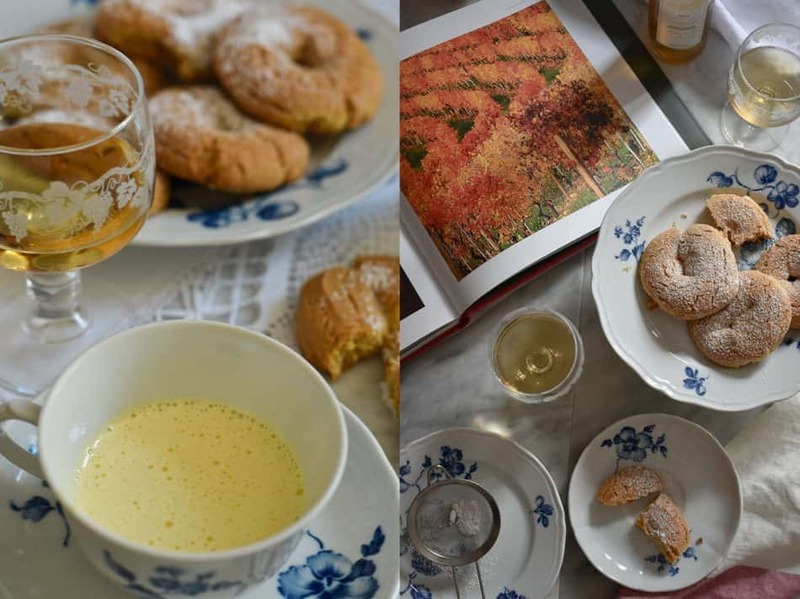 The cook book about the food of The Languedoc region that I have at home offers so many mouthwatering recipes using chestnuts and since I didn’t grow up in a culture of cooking with them, it feels almost like a whole new ingredient to play with. There is something atmospheric about the cold weather and watching the rain. In Rome it is a big change this year weather-wise. You just feel like nesting at home and being surrounded by homemade comfort food. I feel like baking a lot more and crave for custardy puddings and desserts. Far breton cake from Brittany is one of those that I have been meaning to make almost forever. You can have it as a pudding or for breakfast gently heated up in the oven. You have to have it warm. It is similar to a clafoutis (click for a recipe here) but it is slightly denser and more custardy. I love the extra kick of cooked prunes in cognac (armagnac or brandy), a process that also makes them softer. Once I tried to use rum instead of cognac but personally I didn’t feel that it created the desired effect. The best way to find out if my desserts are a success is to hear the Dégustateur say: I could eat them all day long. In fact, there was just one slice of far breton deliberately left for Monday’s breakfast. 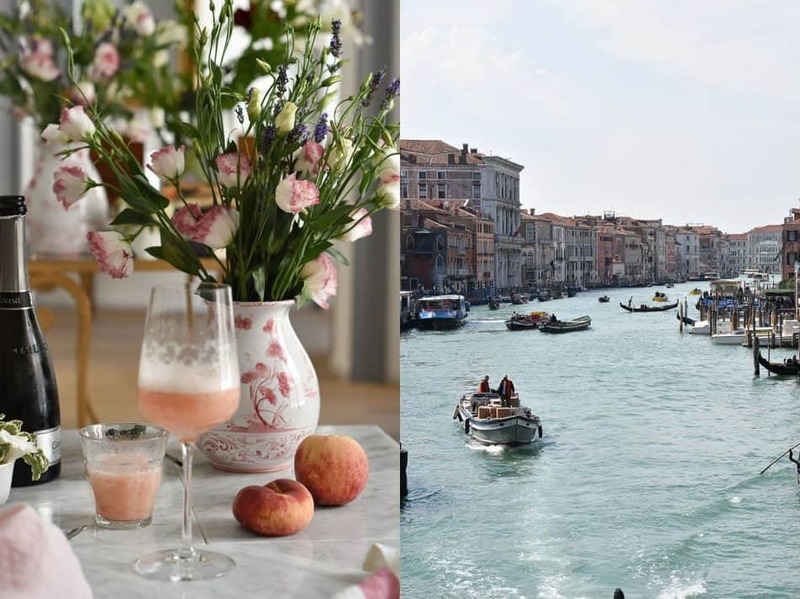 Italy is one of those countries where a vast number of local shops and businesses close in August for a minimum of two weeks on average and everybody departs for a long and well deserved holiday. For us and many locals Rome becomes a very enjoyable city during this month, much quieter and very little traffic on the roads. There is a period of time however, when we choose to leave the city as well. We love road trips and there are certain dates to be aware of to avoid the holiday chaos on the roads. 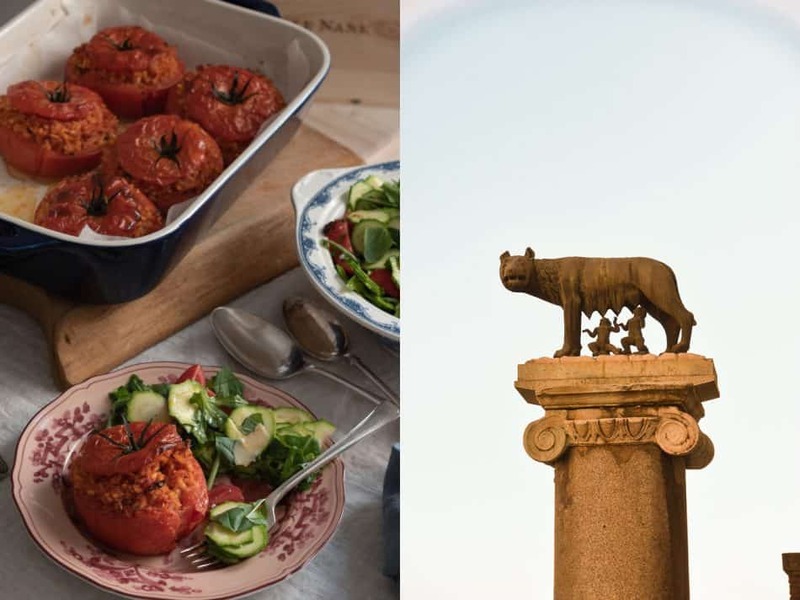 Bearing that in mind and foregoing the obvious most popular holiday destinations in Italy we planned our August escape a long time in advance this year. Our final destination was Piedmont but we took our time to arrive there by stopping at the Tuscan coast for a couple of days first. It was a very easy drive especially as we know the route so well. We have our favourite places to stop at any time of the year. So we recharged our batteries by having a blissful time in the sun, eating gorgeous and delicate sea food accompanied to start with by a glass of very chilled (to my preference) Franciacorta sparkling wine and the sound of gentle sea waves (yes Tuscany is not all about wild boar stews, T-bone steaks, pasta and beans which are all delicious by the way). So we were ready to cover the next leg of our journey. The route as usual took us via Liguria and the city of Genoa to our destination, the Roero region. The picturesque drive through Genoa is tricky at times due to increased local traffic, tunnels and bridges. Sadly on the second day of our Piedmontese trip we learned about the collapse of the Morandi bridge that we had just crossed (two days before). We decided to stay at the same agriturismo next to Canale that we discovered on our first ever trip to Piedmont. The food was as wonderful as I remembered. 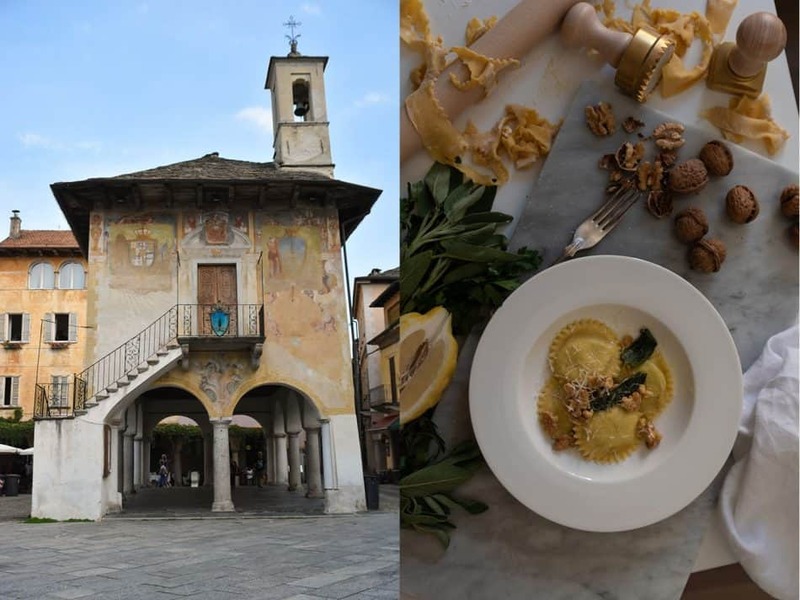 Having been to Langhe, Roero and Monferrato, the most famous wine regions of North-Western Italy, several times (mostly in autumn and spring) by now we really enjoy returning to our favourite restaurants but we always leave room to explore new places. It is hard not to eat well here. One of the most exciting finds on this particular trip was a family run restaurant. Owned and staffed by a couple and one helper. We almost missed it while recovering after driving through the windy roads near Monforte d’Alba. I think there were only eight tables in the courtyard that was the garden of the house bordered by a small chapel on the other end. The village was so quiet when we arrived but we didn’t wait long for the place (clearly well known) to be completely fill up. The highlight of the meal was ”finanziera’ that the Dégustateur ordered. It is a poor man’s stew using the offal, less noble parts of the animal that were left for the peasants, elevated to an elegant dish and served in “agrodolce” sauce. We concluded the dinner with a panna cotta, the most delicious I have ever tasted. I still remember its light creamy texture and flavour. On my next trip to Piedmont I think I will be ordering panna cotta on every possible occasion, it was so good. 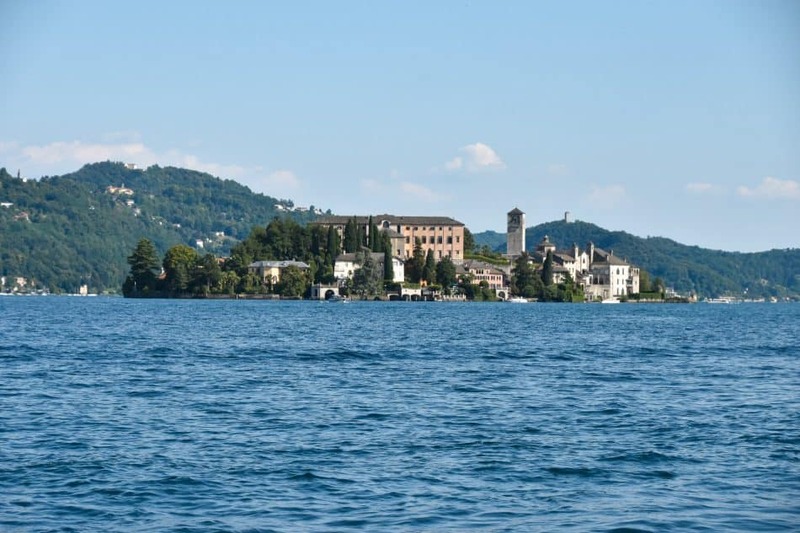 Our next stop and much anticipated was Lago d’Orta in the province of Novara. This small lake of just a few square kilometres with a small island in the centre San Giulio is such a wonderful and elegant place, fairly undiscovered yet by mass tourism as opposed to its more famous neighbours (Lake Maggiore, Lugano and Como). It has always been a lake popular with writers. Visiting or preferably staying in Orta San Giulio, a lovely and sweet village, referred to by some as a little gem, it is a must. It stretches along the shores with plenty of space to sit and admire the unspoiled view. Just a few small floating boats that is all you will see on the water. 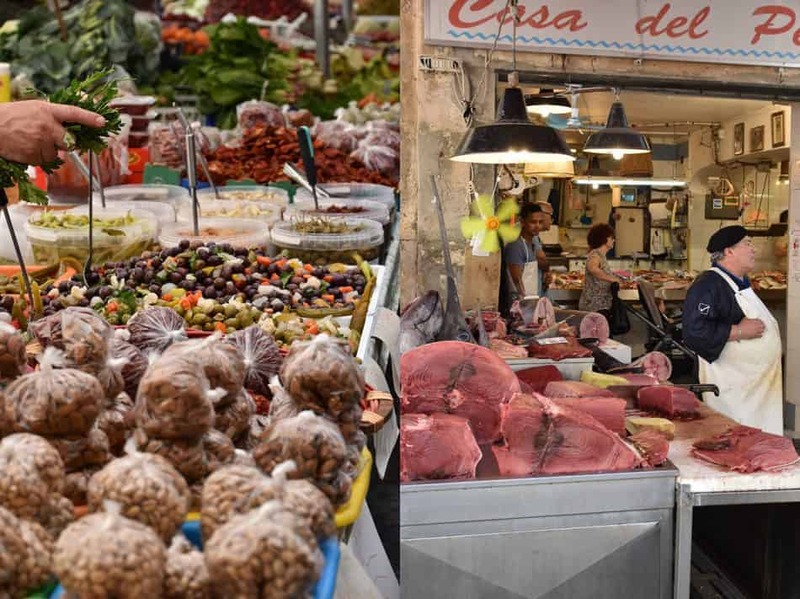 The heart and the meeting place of the “borgo” is Piazza Motta with its weekly market since 1228. The municipal buildings and pallazzi from the late Renaissance surrounding the square are so well kept and add to the atmosphere. 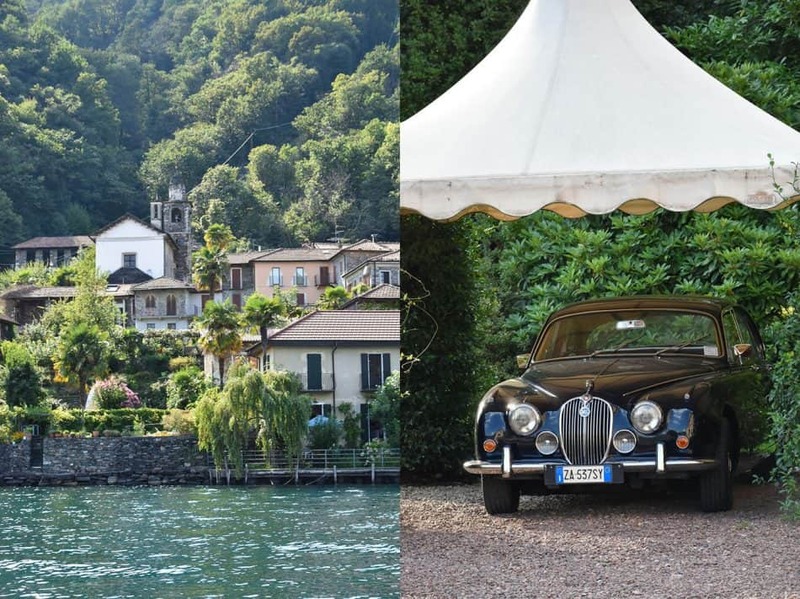 The lake, apart from having been known to writers has become a gourmet destination with Antonino Cannavacciuolo driving this movement. He settled from the Campania region of Southern Italy at the footsteps of the “borgo” in Villa Crespi transforming it into a luxury hotel with its two Michelin starred restaurant. I do watch Italian Master Chef every now and then and having seen his work I have grown very fond of Antonino. Michelin starred restaurants are not high on my priority list but this place I have always wanted to visit. And that is where we stayed on our last leg of the Piedmont trip having an amazing time. 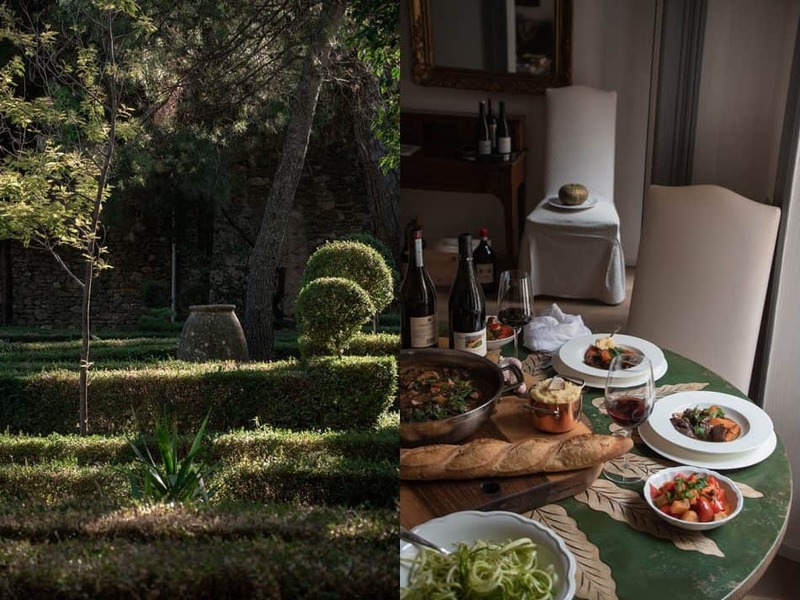 We dined at the Villa Crespi and the experience was beyond our expectations. 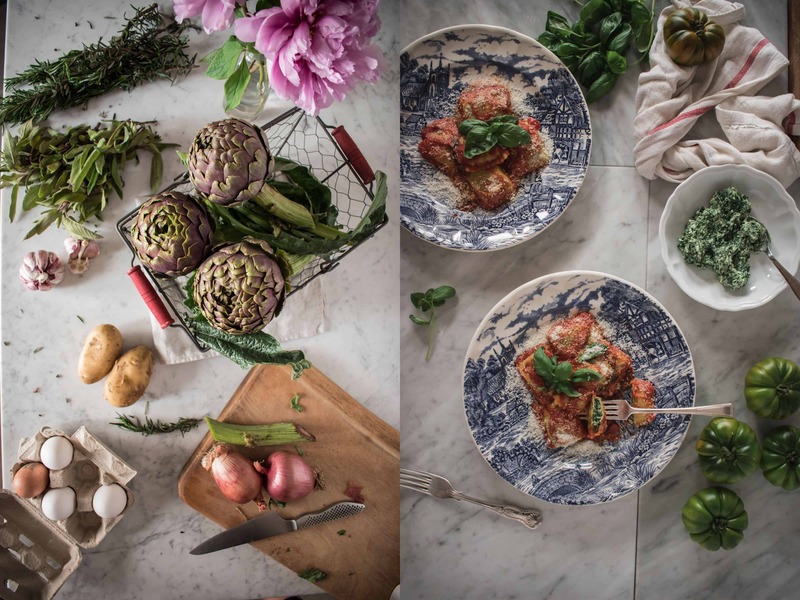 The menu is a journey of classic Piedmontese dishes and the flavours of Campania, the chef’s home land. There is another Michelin starred restaurant just behind the Motta Square, funnily enough run by one of Antonio’s former trainees. 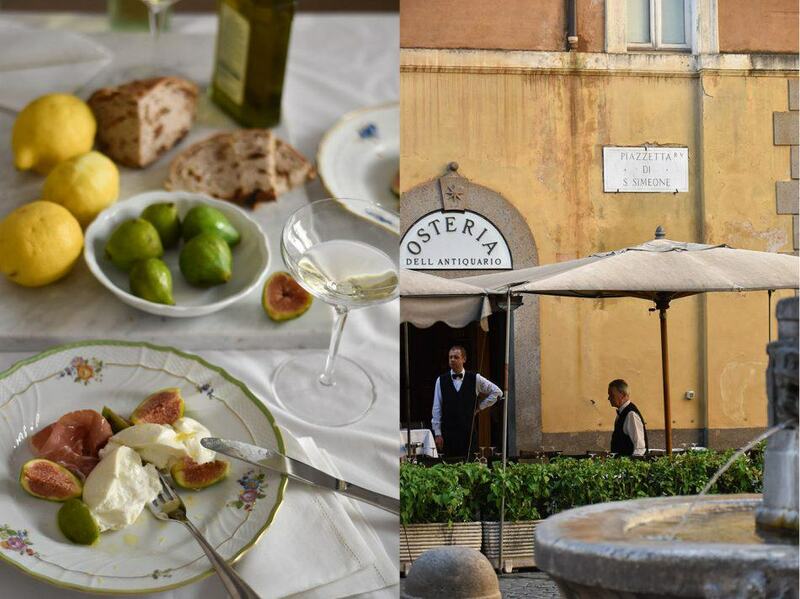 Among many restaurants there is a great osteria Pan&Vino overlooking the Piazza Motta and we visited it almost every day during our stay either for lunch or dinner. It doesn’t serve any pizza or pasta but it offers a vast range of local produce served in the form of a beautiful and generous platters. Local food means local fish from the lake and at Pan&Vino we tried an outstanding fish platter served either raw or marinated and cooked. I still remember that delicate marinated eel which was an another highlight of the trip. We left some space in our gourmet Lago d’Orta trip for other nearby restaurants, mainly frequented by with the locals where is best to arrive on your small boat. It is time to talk bout the “agnolotti del plin”, an iconic dish from Piedmont. Agnolotti are small ravioli, small pasta parcels stuffed with a meat (mainly) with vegetables or cheese based filling. They take their name from the dialect word meaning to pinch, to pinch two sheets of pasta together creating small pouches. They would usually be served just with butter and sage leaves or a dark roasted meat sauce. I had them in broth once, just heaven. To start with here is my version of meatless agnolotti, simply because there are so many delicious meat fillings based on duck, veal, rabbit and so on and I adore them all, which makes the choice slightly confusing. We are still during the end of summer period therefore I found this introduction to these delicate ravioli more appropriate. A concoction of ricotta, spinach, parmesan and nutmeg never fails. On our last visit to Alba I brought back a couple of ravioli/ agnolotti stamps. These are well made and heavy duty ones but the regular ones you find in a shop will be just fine. The larger size stamp is used for meatless ravioli, either cheese or vegetable. Very rarely, almost never, will you find in Italy a big raviolo with a meat filling. It is just too heavy. In Piedmont fresh egg pasta has a higher concentration of egg yolks (also in the Emilia Romagna region) hence richer yellow colour of the pasta dough (use always organic eggs). The extreme is “tajarin” pasta, in other words tagliolini or taglierini (see my older post on Piedmont) that gets its profound yellow colour from that abundance of egg yolks. It cooks just in 2 minutes and that is my choice of pasta if I want to make a simple dish with butter and sage or delicious porcini, paired with a glass of Barolo or Barbaresco (“tajarin” belongs to the territory of Langhe). August is a rather confusing month in Rome. It is extremely hot and the humidity patiently persists. This is the time when the Romans depart for their much anticipated one month long summer holiday, heading to the coast (working hard on their tan) or to their family holiday homes in the countryside. 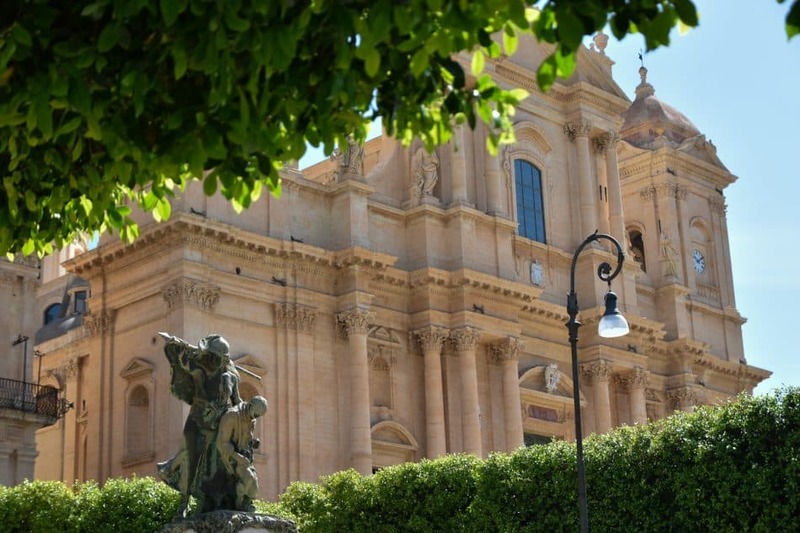 A large number of local shops and businesses tend to close for a minimum of two weeks starting from the 15th of August called Ferragosto, a public holiday that coincides with the major Catholic feast of the Assumption of Mary. Some of our favourite restaurants sadly close too. One may think that the ones that remain open are just tourist traps, but that is not exactly true. Fruit and vegetable vendors also depart for a well deserved rest. 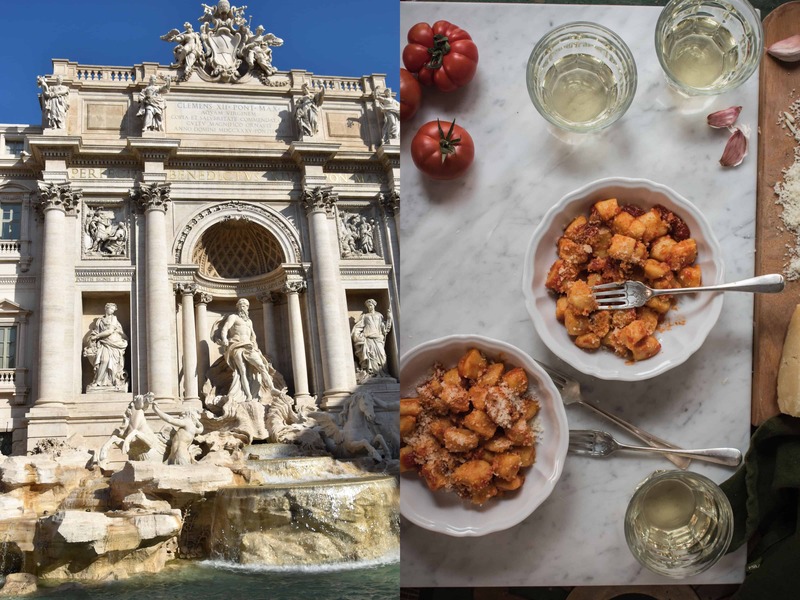 We have been living in Rome for a couple of years now, enough time to learn to some extent our way round, know about shops closing periods (sometimes the hard way) and where to source all the food we want. The choice is slightly limited during this period but we will not compromise on the quality. Amazing what just a few years in Italy can do. I have always been used to walking and going to extreme lengths to buy something as trivial (to some) as good bread (sourdough or yeast bread where time and ingredients are crucial) or cheese and meat of course. For ”The dégustateur ” that was something new and I must admit, he loves it. Well, what’s not to like. We are spoilt that our food shopping route runs through or near the mayor Roman attractions and monuments. It does feel like living in a museum at times. Early mornings and early evenings are my favourite parts of the day. To see a city waking up has always thrilled me. The air seems so fresh. 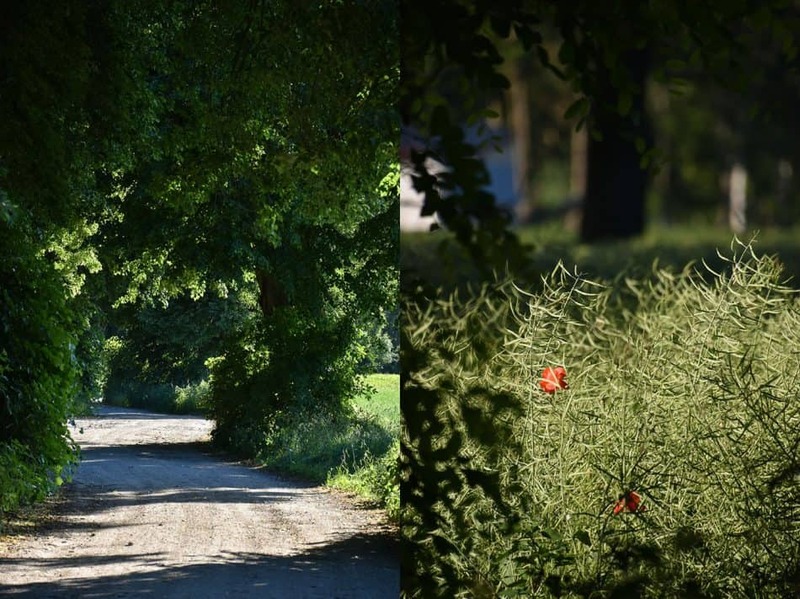 Almost empty streets and pavements enable me to stroll undisturbed while admiring the surroundings and enjoying the very early rays of sun that gently kiss the skin promising yet another gorgeous and wonderful hot day. 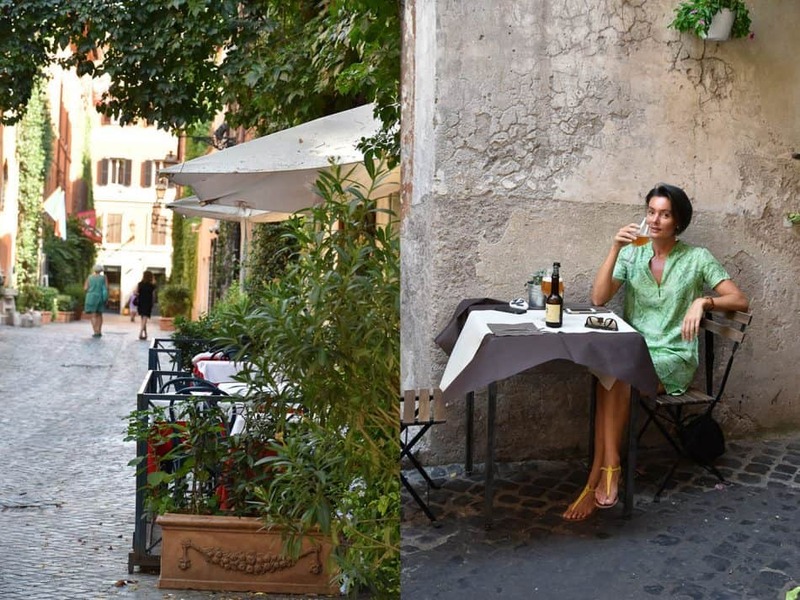 Some locals actually choose to stay in Rome during August to take advantage of the quiet life and traffic free streets. We truly share that attitude apart from a couple of weeks when our gym closes down for the yearly maintenance routine, as they say. 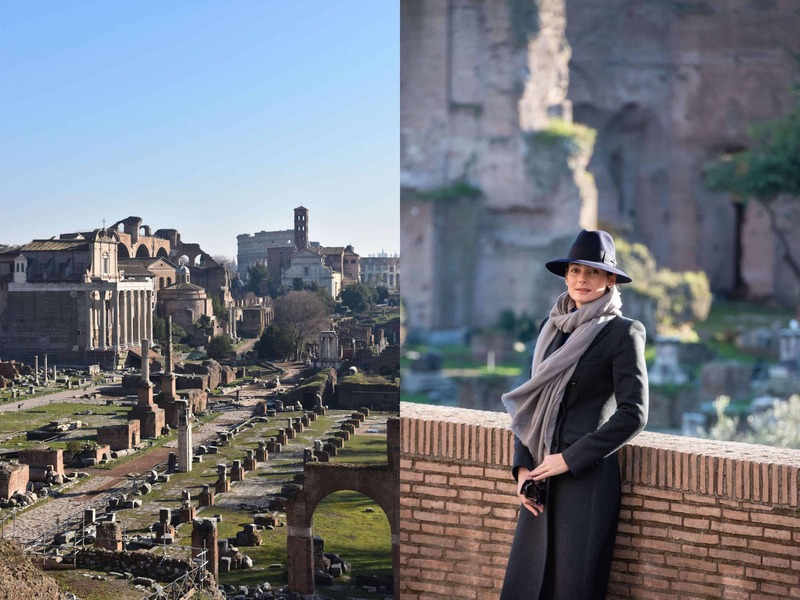 Wisely we don’t want to compete with the large numbers of vacationers and choose the spots and timings for our trips outside The Eternal City quite carefully during that period. Towards the end of August and first week of September life in Rome slowly gets back to normal. My local grocery stores gradually build up their stock upon their reopening, the morning chaos caused by smaller or larger delivery vehicles begins. The coffee bars fill up with locals demanding their morning coffee and cornetto, before heading to work creating a wonderful buzz. At such an early hour when I depart for my food shopping tour most of the tourists are just waking up or having breakfast. This is the only time of the day when the narrow streets of the city are not crowded with tired and occasionally confused tourists trying to work out their maps and being unaware that they have to share their space with other passersby not to mention scooters and cars. For many September means the end of summer and that is very true from the weather and geographical point of view. Here in Rome on the other hand it is a fabulous month, an extended summer. This is actually one of the loveliest months of the year. I can feel the slight weather change running my morning errands. It is slightly cooler, fresher and in no way less pleasant, quite the opposite. The dégustateur joins me when he can and we start the day first by having a coffee together and a small bite usually at one of the historical cafès in the vicinity of the Pantheon. In the morning the coffee bars offer a very generous selection of cornetti (either served on their own or with a custard, pistachio or marmalade filling) and pastries which we eat standing at the bar. The pizze, panini and tramezzini are usually displayed some time before noon depending on the establishment. By the time we return home the sun and the temperatures have already risen promising yet another very warm and a pleasant day. With the gentle temperature drop I slowly gravitate to some of the Roman food classics of the summer period. While tomatoes are bountiful I have chosen ”Pomodori al riso”, baked stuffed tomatoes with rice. The filling consists of just a few ingredients which is so representative of Italian cooking. It is all about the simple and good quality ingredients beautifully put together so you can still taste each one of them. They are harmonious and compliment each other. All you need is some shallots, tomato sauce, Pecorino Romano, fresh basil leaves and (risotto) rice of course. This is the period when you can find bigger tomatoes that perfectly suit this dish. Traditionally they are served with roast potatoes which I occasionally make too. In such case the whole meal is more filling which means I will have a few tomatoes left for next day. Just heat them up in the oven and lunch is ready. I love that kind of cooking. It is not only time saving but also the flavours improve over night. I have recently tasted a great courgette salad in one of the local places that we often frequent and I have recreated it at home. It has become our latest favourite. You will need is a couple of medium size Romanesco courgettes, sun dried and fresh tomatoes, rocket salad and mint or basil leaves. All tossed together with some lemon juice and olive oil, finally topped with shaved parmesan. A steak is always a good choice at any time. In Italy the way butchers cut their meat varies slightly from North to South, but a beef fillet, sirloin or ribeye remains unchanged regardless of the geography. The dégustateur says I have spoiled him from having a steak anywhere else but home. Well I take it as a compliment especially that we all know that these cuts are not as even and uniform as they are prepared for a restaurant, where you can fry them with eyes closed, no touching, just relying on timing. Today I paid a visit to the one and only friendly butcher’s and chose chicken legs. I asked to have them skin off and divided into drumsticks and thighs. 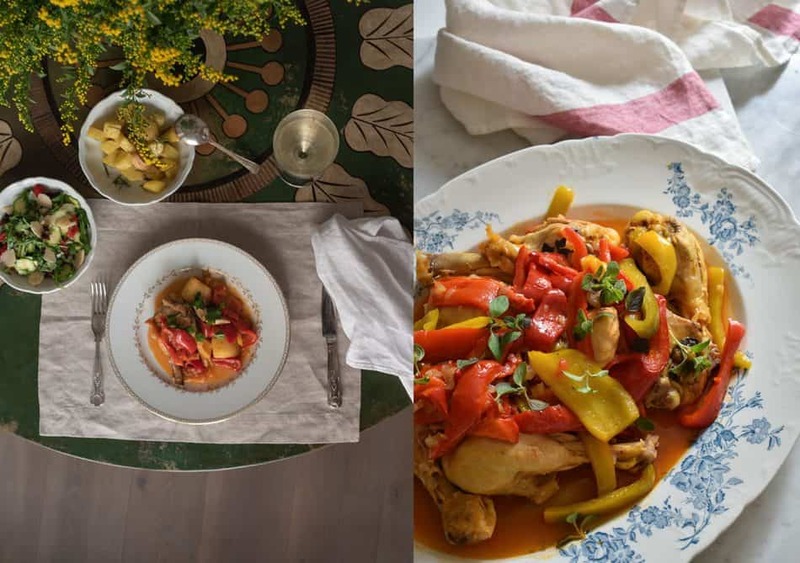 We are still celebrating summer so I made ”Pollo alla Romana”, Roman style chicken cooked with white wine, onions and an abundance of peppers and marjoram. So few ingredients can create a delicious meal. To accompany the chicken just roast some potatoes and that is all you need. Perfect late summer cooking and flavours of which I am very fond. Rome, summer heat, long days, bright skies and the humidity that you learn to love with time. 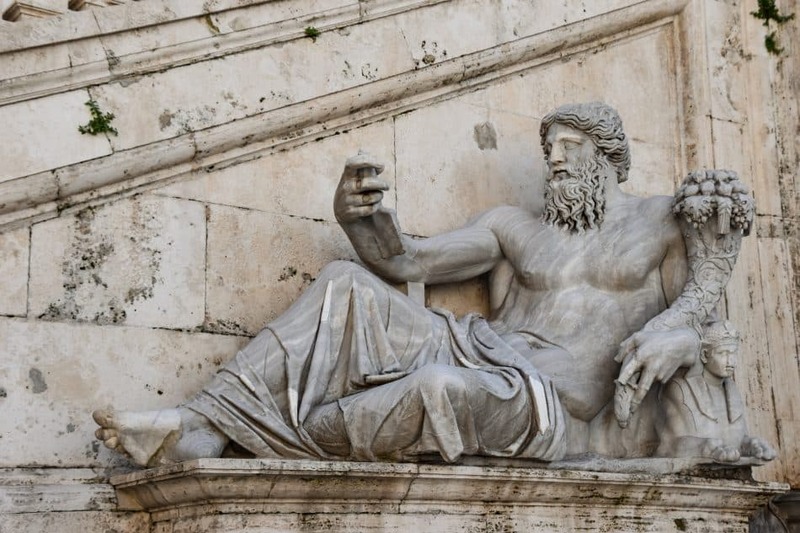 Throughout history so many painters have tried to immortalise the light of The Eternal City on the canvas, so many writers have made an attempt to recreate it on the pages of their books. One of the most loved writers in Italy, after having spent some time in Rome working as a film director, has stated that Rome doesn’t have one colour palette and has individual shades for every person. On the contrary, there are so many of them, for each citizen of the city and one for every day tourist. Not only that, the colours change according to the mood of the observer. Every person receives a sort of a personal gift that can only be shared in a small part. The late lazy lunches are our form of indulgence and to capture that time of the day … I decided to lean towards the abundance of ripe figs, the season is so short that I just could not stop myself including them almost daily … and sweet but still refreshing Amalfi lemons with their gorgeous yellow colour that decorate and give a lift to the kitchen. Summer heat almost prevents you from spending too much time in the kitchen….and there is no need for it. What makes the magic is the quality and choice of ingredients, all kept fairly simple and accompanied by a glass of chilled Prosecco or white wine. The so called Italian ‘antipasto’ (a starter) is of great importance to me, it is the start and the introduction to the whole meal…. Burrata is always a great choice, mostly served here with tomatoes or anchovies, but I can’t resist the fig and ham flavour combination (some grated zest of lemon and drizzle of olive oil). By now I have chosen my favourite bakeries and the fact that they are not directly at my door step makes my stroll to them even more exciting. Starting with Piazza Del Popolo the route leads alongside the Pantheon, through Piazza Navona and finally it is time to cross Campo De’ Fiori…..Getting my bread has become not only an every Saturday pilgrimage but also a treat especially when stopping for a coffee and “cornetto” on the way. 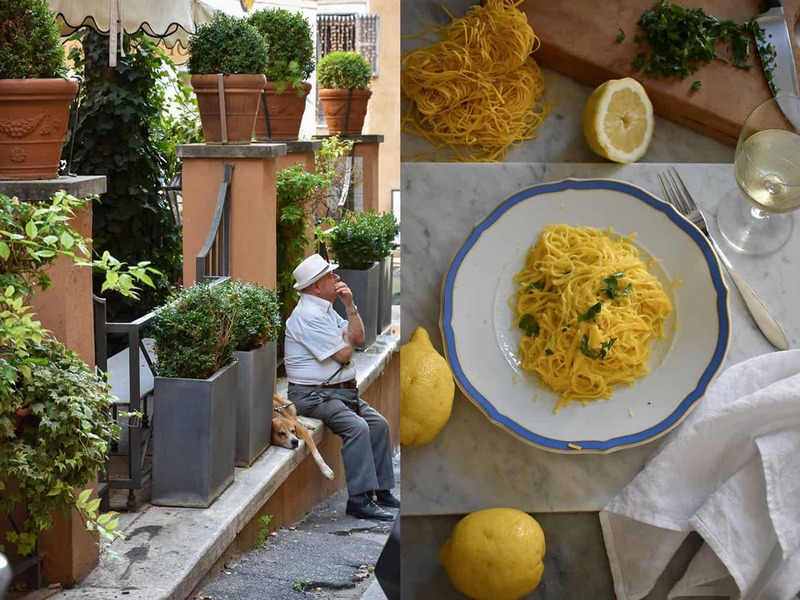 At home we have pasta very often, so for a lazy lunch and a lazy cook during the summer months the most appropriate is a lovely and delicate “tagliolini al limone”. It is actually a recipe without a recipe. You need a portion of fresh pasta that requires only about 2 minutes of cooking time, grated zest of lemon and it’s freshly squeezed juice added to gently melted butter with olive oil. Once the pasta is ready just toss it together in a pan with the lemon juice and adjust the seasoning to your taste. Add more butter if you like a creamy texture. Almost no work involved but good lemons are a must. While on a fresh lemony note, chicken escalopes are served. Once again, almost not really a recipe. Flattened chicken breast takes no time to cook and beautifully absorbs the flavours of the sauce (created by deglazing the pan with some white wine and adding the lemon juice) while finishing off cooking the escalopes. Just sprinkle with freshly chopped parsley and the main course is ready. 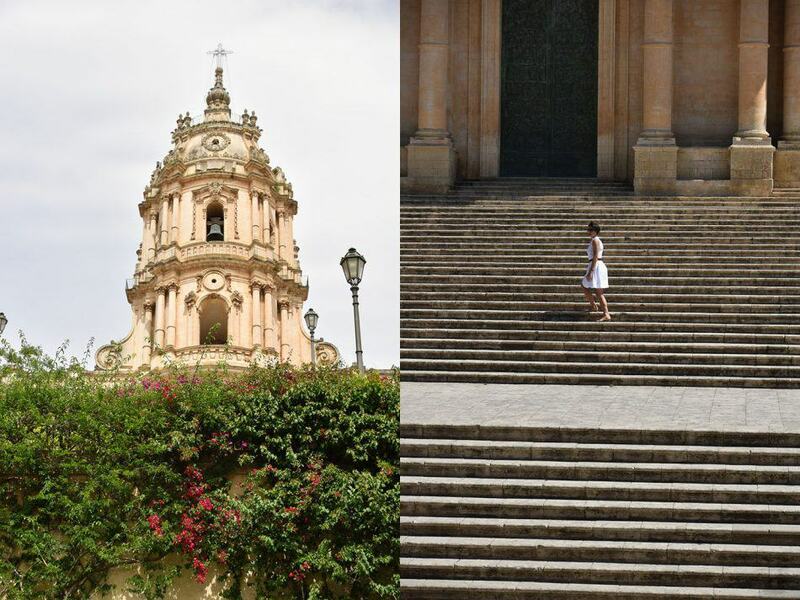 ” To have seen Italy without having seen Sicily is to not have seen Italy at all, for Sicily is the clue to everything ”, Johan Wolfgang von Goethe. 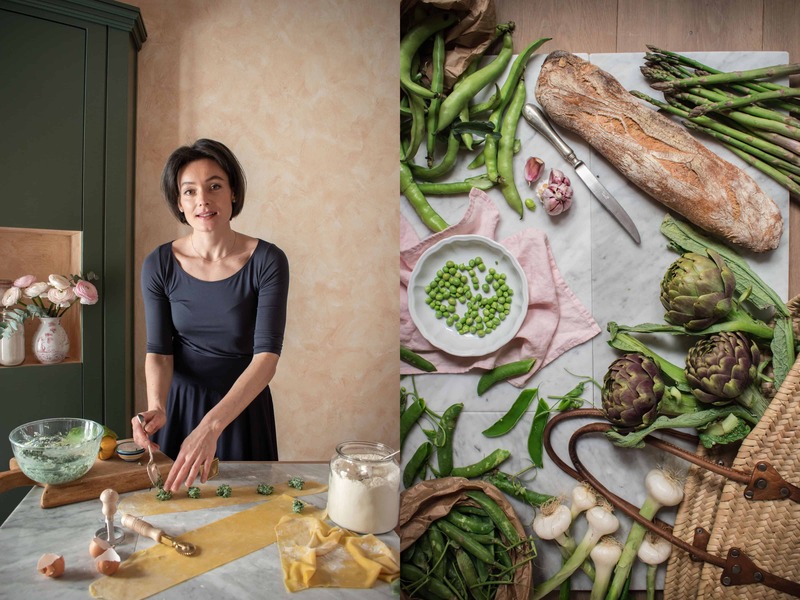 The Sicilian food, ”La cucina siciliana”, that we know today is a fruit of a very long process of transformation and the gastronomic influences of diverse cultures that approached the island in the past. The first wave of people to invade Sicily were the Greeks, then the Romans, the Arabs (sweet and sour influences), the Normans and the Spanish. After that there were the French (bringing chefs from Paris and cooking the fashionable French food of that time) and the Austrians. Sicilian cuisine is expressed in the baroque, baronial cooking of the Sicilian nobility on one part and the other in ”la cucina povera”, poor man’s food where you have to be clever and creative with the ingredients available, but above all the biggest influence on Sicilian food has been it’s territory, the land, the mountains and the sea. Many cultures introduced their produce to the later Sicily, but ultimately it is the terroir that decides what can grow. Sicilians prise fish and shellfish above meat. Tuna and swordfish (”Pesce spada alla Messinese” ,Swordfish Messina style) especially are a staple dish. Once available in abundance, sadly due to overfishing that is no longer the case. Of course we can’t forget about prised red prawns (best eaten raw) coming from the cold waters of Southwestern Sicily. The fact that there are ”thousands” of variations of the same recipe (and there are plenty of them) and of course each one of them is the best, it sparks off endless animated conversations about ingredients and the methods of execution. Due to the above, it is not an easy task to tell the story and introduce the recipes of such a complex and diverse island. But like with everything, one has to start somewhere…and I only share here the dishes that I particularly like, that I make often at home or I am inspired by, creating ”my” own version of them. I think that one can envy how Sicilians very harmoniously and skilfully put on the plate what comes from their land and sea. Almost as if wanting to say, what grows together goes well together, a perfect match. 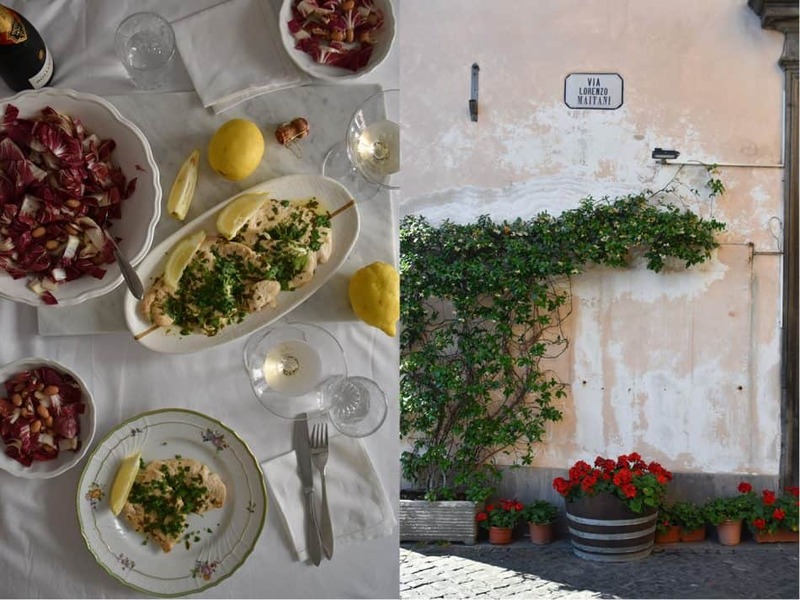 Certain flavour combinations may initially, or at least during the first visit, seem a bit odd, but after immersion in the Sicilian food culture, these flavours will seem fantastic and extraordinary. Sicilians mix very well swordfish, sultanas, capers, breadcrumbs, wild fennel, sardines or tuna with Marsala wine in a pasta dish that I tried in the Island of Ortigia…and still can’t forget about it. Throughout the whole period while oranges are in season I prepare an orange salad / insalata di arancie, which is a traditional Sicilian dish. I serve it either as a part of antipasto or a side dish, for me there is an unwritten rule that this salad can be served literally with everything. Of course there are many variations of the orange salad, I usually add to the sliced or cubed ripe oranges: olives, thinly sliced red onion and occasionally sliced fennel. I always have in my cupboard a jar of very fragrant dry Sicilian oregano that I sprinkle on top of the salad. A generous glug of extra virgin olive oil makes the dish come together. 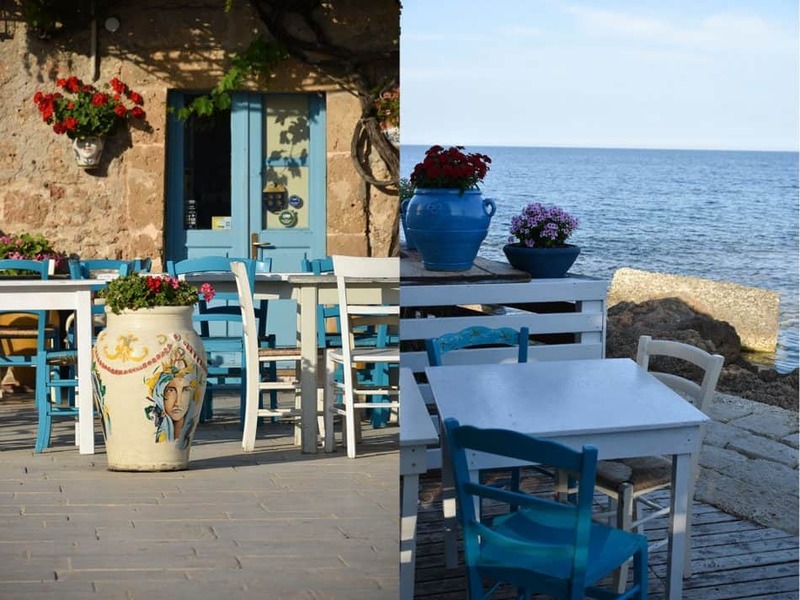 When I serve it along Pantelleria-style salad (using very best capers from Pantelleria, olives, tomatoes, red onion and potatoes…) and grilled or baked fish…for us the meal turns into a feast. While across the whole of Italy almonds (mandorle) are used in cakes, tarts, amaretti biscuits, almond paste, marzipan and Amaretto liqueur, in Sicily they are also used in savoury dishes, for example in ”pesto trapanese” (tomato and almond pesto) which subsequently can be added to meat, fish and pasta dishes. We have fallen in love with this pesto. First, I roast the almonds, then gently grind them in a mortar with some garlic, peeled tomatoes (tomatoes have to be ripe and sweet ), then I add some fresh mint and of course olive oil. 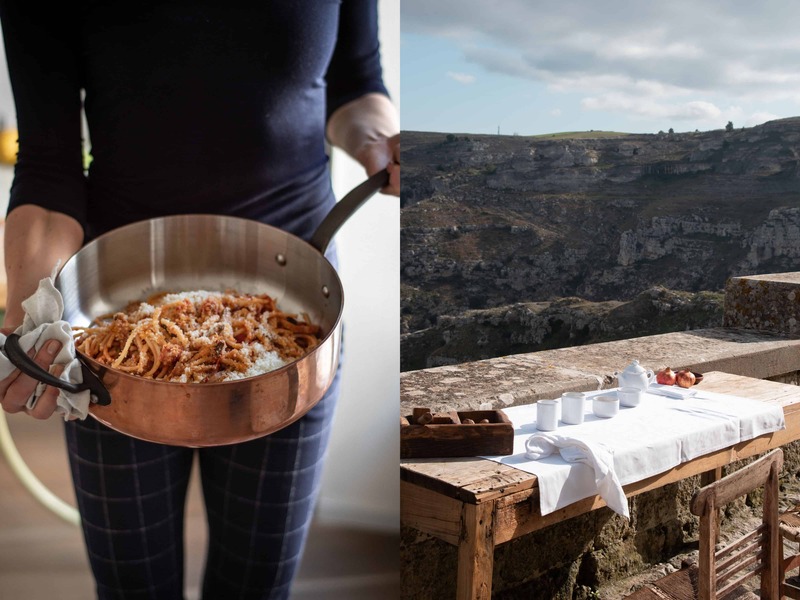 A pasta dish, the first Sicilian dish I made even before exploring the island, is ” pasta alla Norma” with aubergines, tomatoes, salted ricotta and ”malfadine” type pasta as my personal choice. I adore aubergines ”melanzane”. Quite often I grill them and keep them under olive oil and serve them as a part of antipasto. For some they may be a bit troublesome because they tend to loose undesired water while cooking, frying or baking as a part of another dish. Once you remember to sprinkle aubergine pieces with some salt and leave them to drain for a couple of hours, all your problems should be solved. In northern Italy, in the pastry shops you will see very fine fresh fruit tarts. In Sicily, fresh ripe, juicy fruit which is often sold by a fruit vendor on the street in the heat of the summer, is eaten fresh simply as it is. Instead of using it for baking, the abundance of fruit is candied or made into marmalade and conserves, to eat throughout the year. The most famous of Sicilian desserts and pastries across and beyond Italy are “cassata” (decorated like a piece of art ricotta cake) and “cannoli” (pastry tubes filled with fresh ricotta). In the very persistent heat on the island you would use fresh ricotta instead of pure cream and nutty biscuits that are made with oil, pure pork fat “strutto” (traditionally used for frying the cannoli tubes) instead of butter. In pastry shops everything is highly decorated while playing with different colours: green, red, bright yellow and candied citrus peel as well as the icing and chocolate. The atmosphere is dense and thick from the essential oils released by pistachios and almonds. 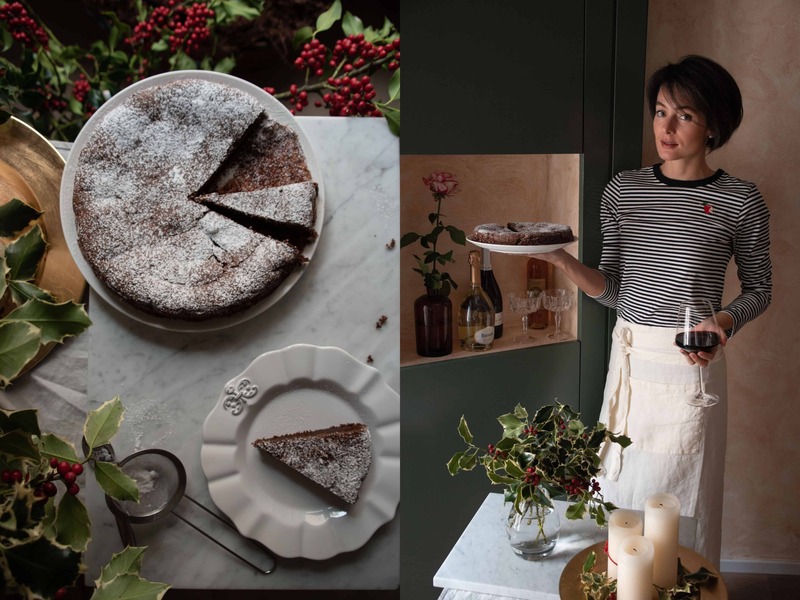 While the savoury dishes are simple and representative of “la cucina povera” (poor man’s food), when it comes to cakes, pastries and desserts the Sicilians show off totally and go wild celebrating the baroque …Probably they have the sweetest tooth in the whole of Italy. June is here…and longed for summer has come…it almost seems to be the same sequence every year, first home grown strawberries that have always been an indication of the end of a school year (at least for me), the crops have grown showing their strength (giving high hopes for the bountiful harvest yet to come) releasing their particular recognisable smell and colours especially for those who have spent summers or at least some time in the countryside. Every year I wait for one of my favourite summer soups: polish “botwinka” that calls for beetroots grown in a particular way in my mother’s orchard accompanied by heaps of fresh dill that I can’t have enough of….freshly picked from the garden and chopped with its smell so addictive like no other herb. But there is nothing wrong about the repetitive sequence of the seasons that have always dictated what we eat (at least in those parts of the world where the supermarkets are not providing the same produce the whole year round or when we make our own choice of eating seasonal food). 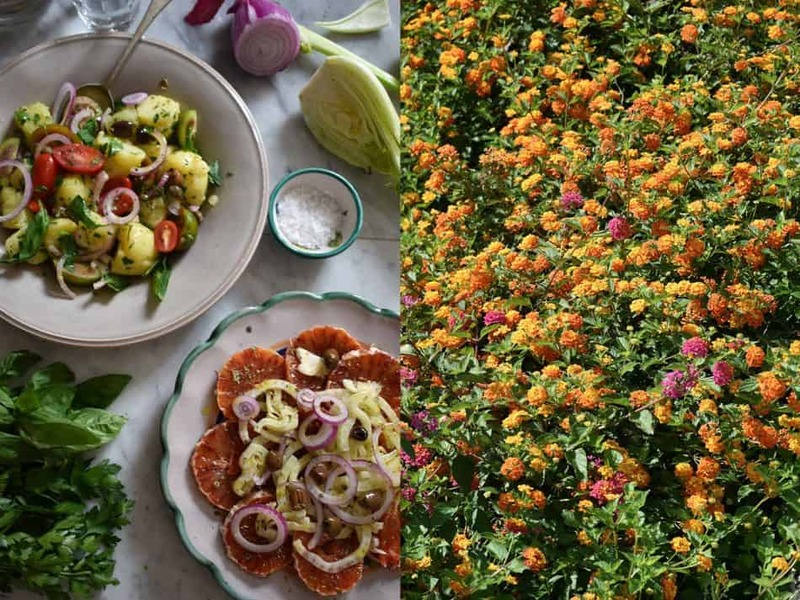 Moreover, waiting for summer, its flavours and summertime dishes using the ingredients at their best has something mesmerising and romantic about it. 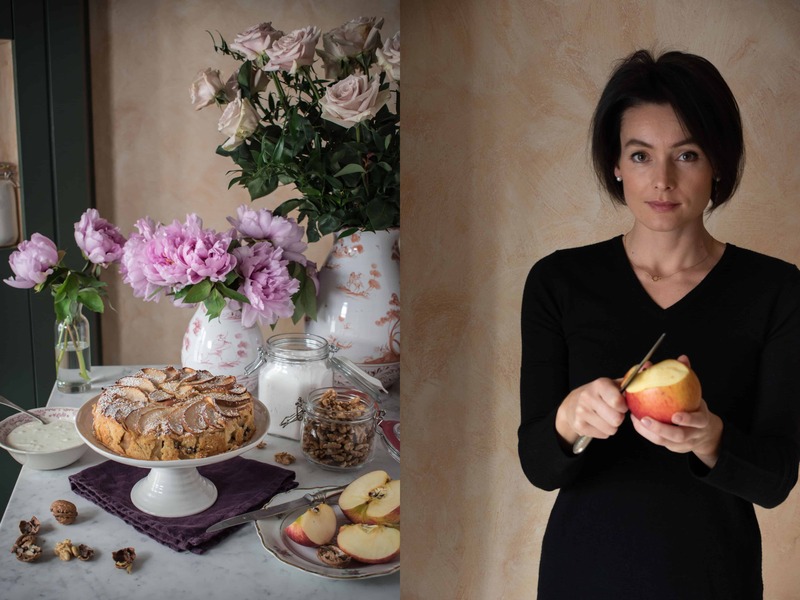 As much as I enjoy eating and making the very well known summer classic desserts, cakes and puddings that I grew up with, I remain open to new flavour propositions that I come across whilst travelling or just living abroad. They are not better or worse, they are just bit different to what I got used to and play an equally important part in our diets. 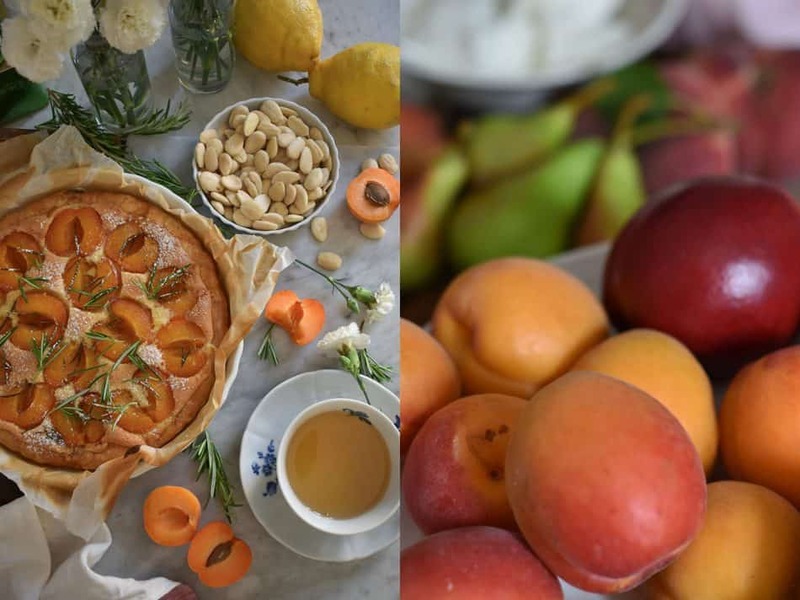 In the past, I only used fresh rosemary for making savoury dishes, but one day I decided to combine these earthy flavours with a apricot and frangipane (a creamy almond filling) tart. The flavours just complement each other, they are delicate and not overpowering plus the apricots become so tender but still hold their shape. Cooking with red and white wine is not purely reserved to meat and fish dishes or even risotto. A mixture of wine with spices (like cinnamon or cloves ), sugar, fresh herbs and orange zest (for example) cooked with fresh fruit: plums, peaches or pears enriches the fruit giving it a particular and delicate flavour derived from the choice of spices and herbs used. Fresh rosemary again plays an important part in one of the plum desserts that I actually love serving anytime. My personal choiceI are plums that are still firm in texture. Cooking or baking them while already soft will result in a mushy texture and subsequent loss of their shape. Here is my version of plums baked in white wine with rosemary, sugar, cinnamon, cloves, orange and lemon zest. Plums release more flavour through the heating and the spices enhance their taste. The wine during the baking process will reduce and turn into a lovely dark coloured syrup that I sprinkle generously over the plums. 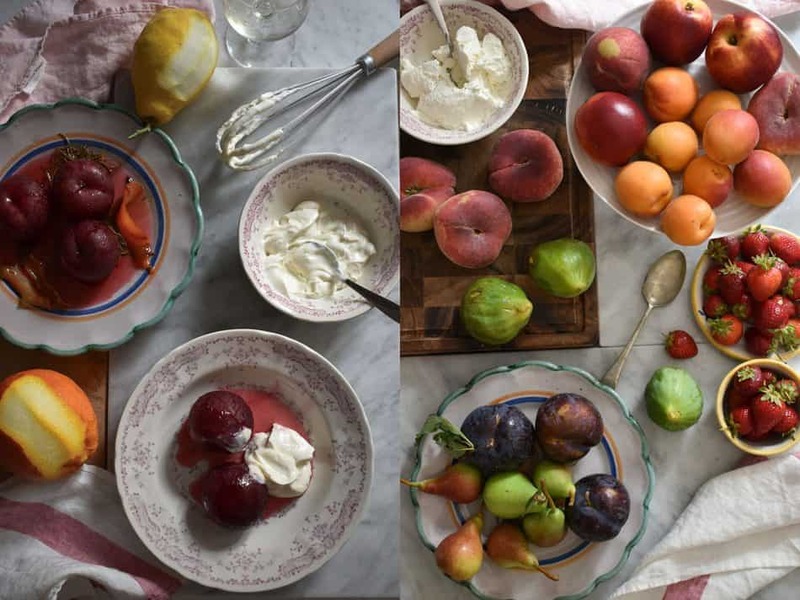 But the full indulgence begins when I serve the plums with some whipped ricotta (or mascarpone cheese) with sugar. Many years ago while spending an unforgettable summer holiday with a truly warm Italian household, I was introduced by a very dear and just wonderful person, Rita, to “Macedonia”. 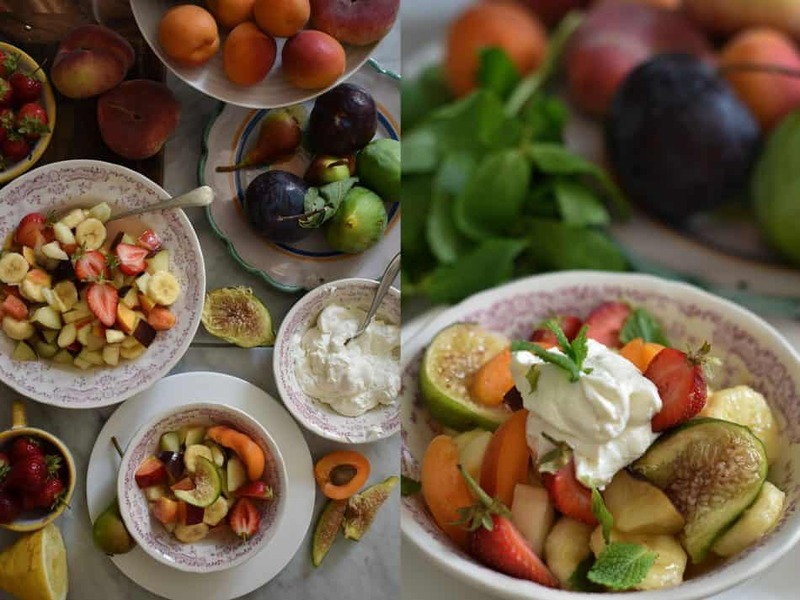 A fruit dish thats success depends on the variety of the ingredients. There would always be apples, pears and bananas, as well as lemon and orange juice sweetened with a small amount of sugar to taste. To that base you can add all the seasonal fruit of your choice. I sometimes add some fresh mint and whipped ricotta or mascarpone with a small amount of sugar to create a more decadent dessert that is just perfect for or taste. According to some acclaimed food writers, peaches are the most beautiful and delicious of all fruits. Well, I will not disagree. I enjoy them mostly fresh, macerated in wine, added to “Macedonia” or used in cocktails. There are very few cocktails that I enjoy drinking nowadays. They have to be simple, not overly complicated, well balanced and consist of good quality ingredients. When fresh fruit is used it should be ripe and naturally sweet, so there is no need for extra sugar and you can focus just on the flavour of the main ingredients. One of those cocktails, Bellini (that automatically means that peaches are used), is a wonderful example of a summer drink. A secret to a very good Bellini is the quality and choice of the peaches. A few years ago we were on a road trip, as we very often are. With all the possible flight connections that could make our life easier, saving an enormous amount of time, whenever we can, we still choose to drive. I actually enjoy the road trips. There is so much to see on the way and one is totally independent and self sufficient. Moreover, I tend to bring a lot with me back home, and I am not referring here to clothes or shoes. Theses days it is all about the food and unique produce that is hard to buy locally or take on a plane, not to mention the wine. A moderate quantity of it will find its space in our car but anything over six cases we ship home. I also feel sorry for the car carrying so much weight on the return journey. It was almost the end of summer, warm, sunny and the vines of precious nebbiolo grapes almost at their prime getting ready for the harvest the following month. By pure mistake (we wanted to arrive to our splendid agriturismo at a decent time) we took a convoluted country route. This time I was thanking the sat nav for it because the introduction to the area was just breath taking, with all the farms and architecture that takes you back in time to the film “1900” (Novecento, “Twentieth Century”), an Italian historical drama with its iconic cast of Robert De Niro and Gérard Depardieu. Since then Piemonte has become a place for a yearly pilgrimage, a couple of pilgrimages a year in fact. The wine we buy is mainly shipped, it never seems to be enough. On the first night we ate on the beautiful terrace of our agriturismo. It was here that I was introduced to “tajarin” pasta with porcini (ceps) muschrooms and advised not to add Parmesan cheese so it will not get in the way of the glorious and earthy aroma of the mushrooms, cooked to absolute perfection. “Tajarin” is a piemontese version of humble “tagliatelle” (made of simple ingredients: fine flour 00, water and some eggs), famous for an astonishingly high ratio of eggs (sometimes just yolks), which results in rich, decadent pasta. In the past, “tajarin” was often served with a sumputous ragu of offal from home-raised poultry and rabbits, which is so typical of “La cucina povera” (poor man’s food using the humble resources available). A more simple way of preparing it, not to be confused with lesser Piedmontese, “tajarin” is served with butter and sage (my small twist on it is to add toasted hazelnuts and just a touch of grated lemon zest), or with wonderful porcini (ceps) mushrooms or with the region’s legendarily prized white truffles from Alba. I don’t think it is appropriate to use the term: “Italian cooking”. Instead, “the cooking of Italy” and of its regions seems to me to a better definition of the true Italian food culture. At the footsteps of the Alps lies Italy’s major plain, which spreads from Venice (Adriatic coast) westwards towards Lombardy and into Piedmont. This is the dairy zone of Italy where the fat used for cooking is butter and the staple cereals are rice for risotto and cornmeal for polenta. 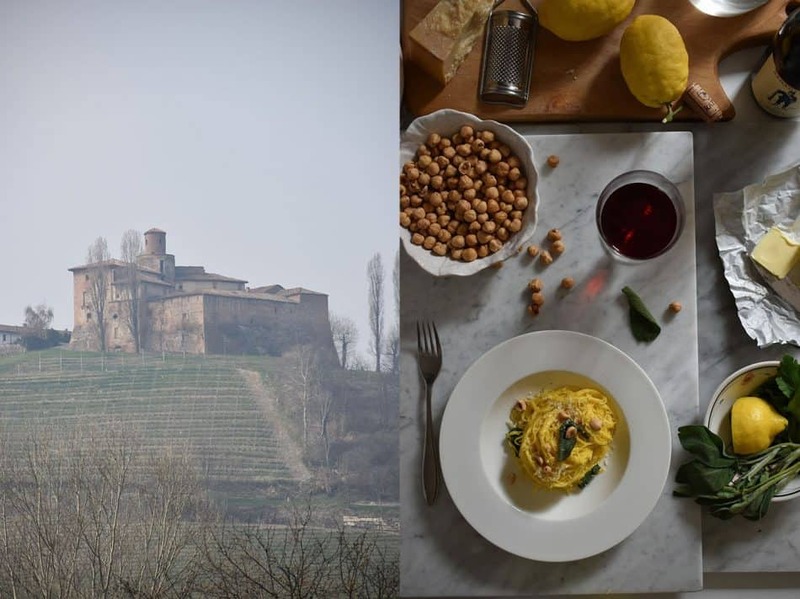 Piedmont, isolated by mountain ranges in North West Italy, has developed a strong regional identity that is reflected in continued use of its own dialect and a unique local cuisine, cuisine unlike any other Italian region. It is rich, it relies on lard and butter rather than olives that don’t grow well in this climate. Although having said that, these ingredients bring silky texture and hearty aromas. 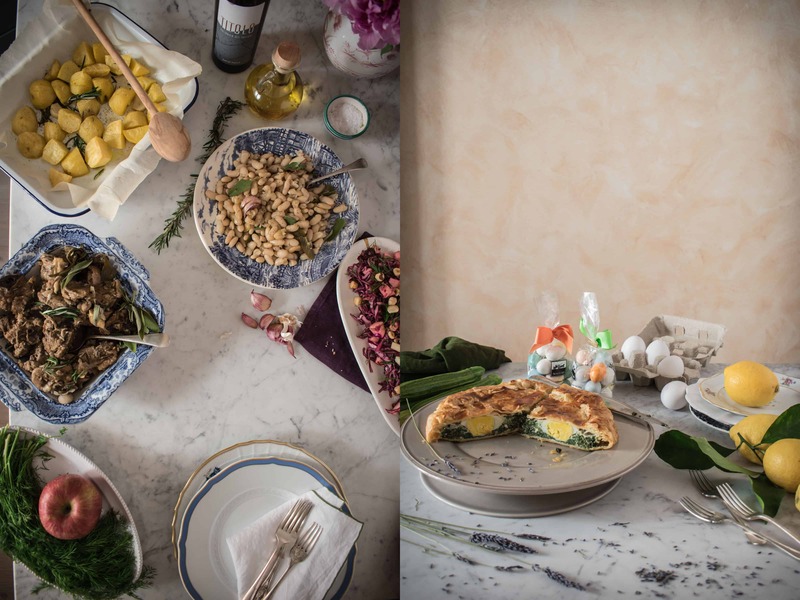 Local meats, game and root vegetables are cooked on a low heat for a long time, slowly developing and releasing flavours as well as giving deliciously rich, tasty character to the food of Piedmont. 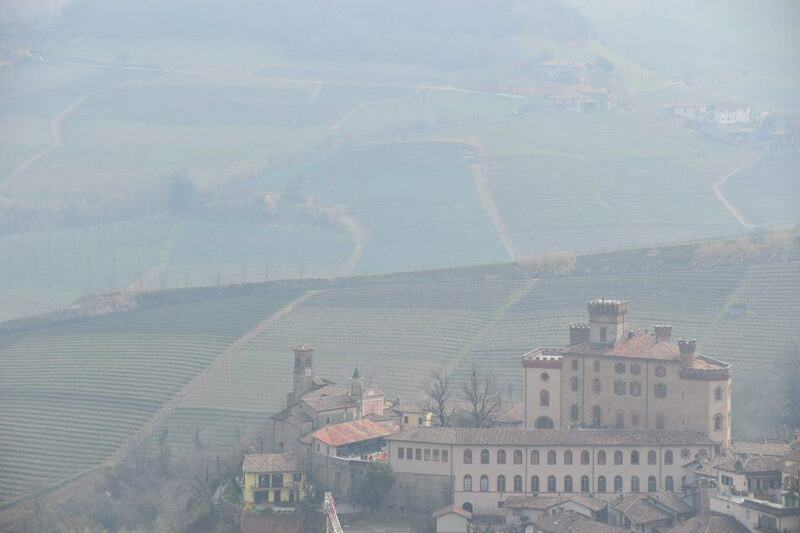 It is said that Piedmont is best enjoyed during the autumn months, when the forests are at their most colourful and a heavy fog starts to settle over the land. I think the scenery is wonderful all year round, and in spring, just couple of weeks ago… I did not miss the haze. 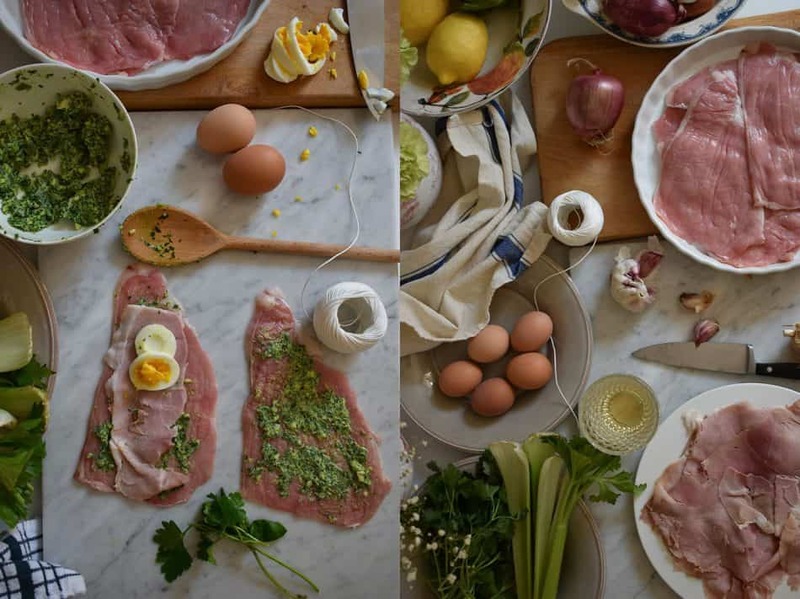 After my latest trip to the region, I decided to make a lesser known version of veal rolls where you use an egg as a part of the filling , Veal rolls with ham and eggs / Involtini di vitella. The recipe is loosely adapted from a book which renews the respect for tradition and memories of the tastes of another time.